Cats are very inquisitive and we all know that open windows are an open invitation to take a trip out onto the window ledge. Do you have a house cat or live in an apartment? Flat Cats may be an ideal solution for you. If, when you have watched the video, you have any questions, just use the chat buttom bottom right or email me at info@flat-cats.co.uk Dominic Parker. Also see our new slide show below with explanations of each slide below. 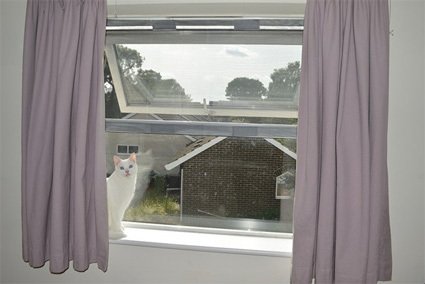 Flat Cats offer an unobtrusive way to allow fresh air into your home and keep your cats safe from the dangers of falling from windows. Can you spot the Flat Cats from the outside? 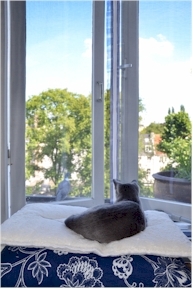 Flat Cats provide an economical and effective solution - protection for your cats from falling out of open windows and offering insect protection as an added advantage. 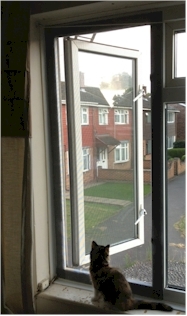 Flat Cats cover your window opening with a specially sized, easy to fit strong pvc coated mesh. Fitted in seconds, it lets in air and keeps your cats in. No drilling of window frames required! Interested in buying a Flat Cat? 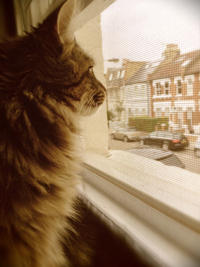 Click here to find out more about Flat Cats window protection for cats..
Click here to read the history of Flat Cats and how they came to be developed. We accept all major credit and debit cards through our payment provider PayPal. You can be sure that your card details are never passed to Flat Cats as all payments are made through the secure PayPal system. My name is Stacey and I purchased 3 custom Flat Cats from you a few weeks ago. I am so impressed! The delivery was fast and I put them up straightaway and they fit perfectly. 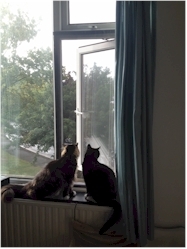 It's so nice having fresh air in my flat and my cats are really interested in all the new smells coming in. I don't know if you remember speaking to me on the phone but I'd like to thank you for your help and professionalism, your customer service is amazing. You have a company and a product to be proud of and I've already recommended you to other cat owners and told all my friends and family about Flat Cats. So thank you very much! 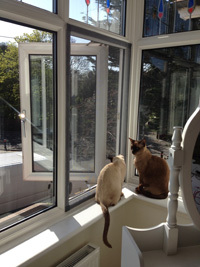 I've attached some pictures of my Neville and Giggsy enjoying the sun and open window in the living room for you to see. Just to say thank you, as you can see our cats love their new screen. I was a bit sceptical about these at first but they really are brill...easy to fir and discreet- you can hardly see them. Hi Dominic, Just wanted to let you know that our screen is a huge hit with our three cats. After a lot of bemused looks and sniffing they are enjoying the breeze as they chill out at the door. It's been lovely to have the door open while it's so warm, only wish we'd got the screen sooner! Thank you Dominic for my flat cats. With the hot weather and my little baby can be cool in the day. They fit perfectly on my windows. And good thing I called you to make them 1cm short, good thing that happened. 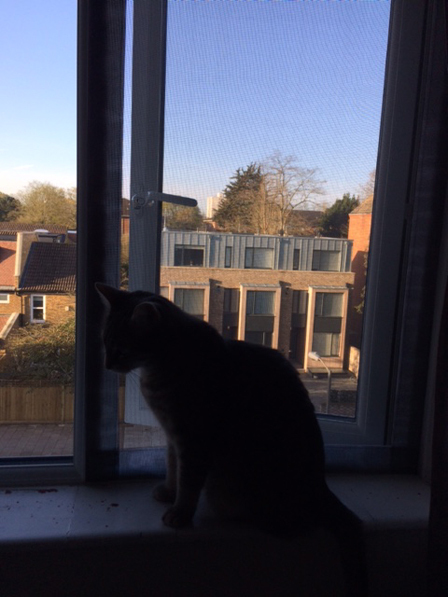 I live in a top flat (3rd floor) and my flat cats blend in, I have white windows but I preferred the grey to look through, and my windows are massive to a little cat, so I’m very happy with them. And bonus they keep the flies and mozzys out. For anyone thinking about buying flat cats from the genius that is Dominic, do it, you’ll never regret it, it’s one investment in life that is worth it. Many thanks for our window blinds we can all breathe again thank goodness. Pictures of our babies sent separately . Payment made for my office one. Just wanted to say many thanks for my flat cats. Such a simple idea really but so effective. 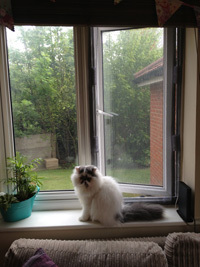 I can now get fresh air into my flat without worrying about my ragdolls jumping out the windows. They really appreciate them too and love sitting by the open windows. Indeed, if I close them the babies sit at them and miaow to get them open again. I hardly notice the netting over the windows, and when I do take it down, the velcro is almost invisible on the window frames, all of which is good news. 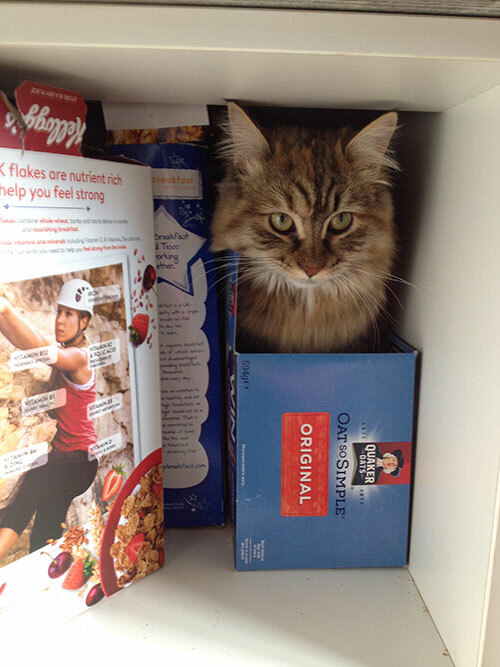 Here’s Elsie in a porridge box, in the cupboard… where else!!! Thank god for my window mesh! Freddie enjoying the small bit of air on these hot nights! Angel & Fratello enjoying some fresh air. Hi Dominic, new window protectors arrived, and fitted. We can now have some fresh air, and can breathe again. I just wanted to say thank you for the great customer service. All my screens are up and working perfectly! Hi Dominic, The new cover arrived and fits perfectly.. thank you very much my boys will enjoy them for sure. Strange how the weather has changed since the new ones arrived..mind you it’s much more bearable isn’t it. By the way, many thanks for your products - they are beautifully made and do the job perfectly! We couldn’t be happier! Essential for us and our kittens in the warm weather! Hi Dominic, just thought I'd let you know how pleased I am with my recent order. It took about 10 minutes to put in place, so very easy. 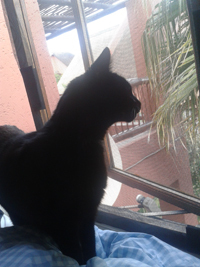 It took two days for my cat to get used to it being there and it's absolutely wonderful being able to have the window open all night, especially during the recent heat waves. Thank you so much. The picture attached is the first time we have had the window open in over a week!!! We can finally stop sweating! 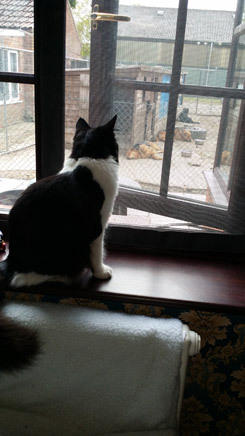 Hi Dominic, Thank you so much for our flat cats - they've made such a difference! I just tried to post on Facebook but it's not playing ball at the moment, so I thought I'd email instead. 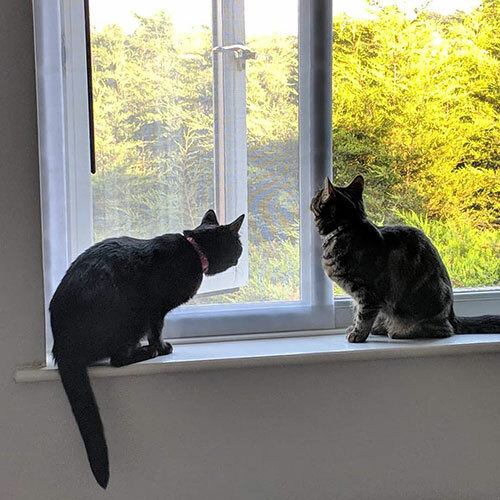 Feel free to share this if you like: Really pleased with our flat cats - having some windows open after so long struggling through the heatwave feels amazing! Dominic's customer service was excellent and the products arrived exactly as expected. Surprisingly, the cats haven't tried to climb them yet but even if they did I'm pretty confident that they couldn't pull them off. Thank you Dominic! Dear Dominic, Just a line to say that I have now fitted all the screens to the windows and I am so impressed, they are amazing! I was able to fit them so easily and they are purrfect (excuse the pun). 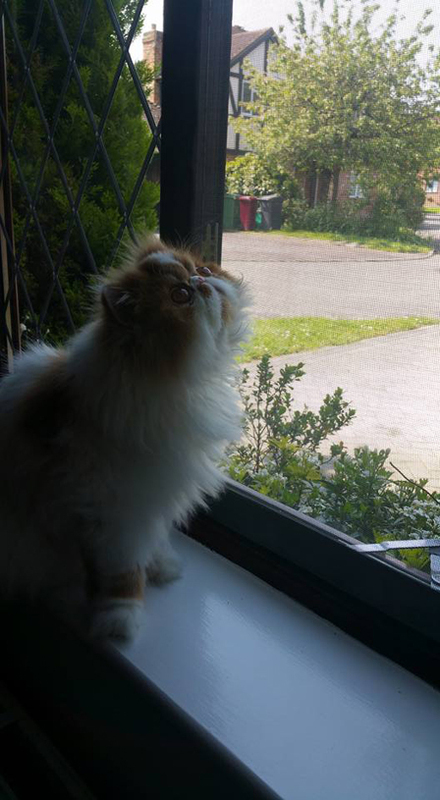 As you can see my little cat can now smell the outside world in total safety and I have piece of mind, thank you again for making this amazing product. I will be recommending you to all my friends. Please do feel free to use the above as part of customer reviews and for advertising. Hi Dominic, Thank you so much for the screens. I realise it's quite some time since we had a rather lengthy conversation with regards measurements and how the screens would fit on my windows. I really did appreciate your patience. 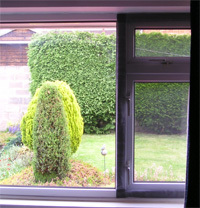 As the sun has finally made an appearance - I have now put my screens up allowing me to open my beautiful sash windows. The puds seem happy with them and I am extremely happy with how they fit - look and I can now let in all the sun and fresh air without worrying about my babies escaping or hurting themselves. I will recommend your services at any opportunity. Thank you again Dominic already we're seeing the benefits of our kitchen ones. I'll send you a picture of Jessie watching the world go by. Feel free to use on your Facebook or website. I've shared with my cat friends so expect enquiries soon. Thank you for our flat cats. As you can see how high we are, I think Simon will enjoy feeling the breeze against his whiskers! Hi Dominic, I have had my screens up a few weeks now. I have to say I am delighted with them. The first thing our cat did was to check they were attached at the top and she hasn't worried about them since. Our cat loves the window open and I don't have to worry about her falling off the window ledge on the top floor or any nasty cats getting in the bottom window. It is quite see through so don't worry about taking it off. It will be great through summer - keeps spiders out too. Hi Dominic, My Flat Cats arrived yesterday and oh my gawsh they have made such a big difference to the temperature inside my apartment. As you can imagine, the Aussie summer is pretty hot as it is so not being able to open any windows this summer has made my apartment an over-sized oven! Hi Dominic, I got my Flat Cats yesterday. Put them up and they are PERFECT! (Or should I say purrfect). Thank you so much! It was so nice to sleep with the windows open and be assured my cats are safe. Thank you a million times! 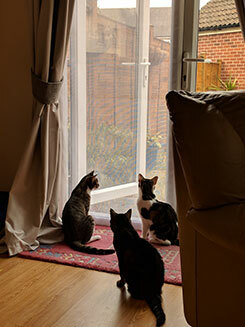 Hi Dominic, My flat cats nets arrived today and I'm so pleased with them, it's wonderful to have some fresh air coming into the house without me worrying that Billy will escape. I received my order yesterday and they went straight up. I can finally open my windows and not be worried about Elsie my cat getting out. The let the light in and are so easy to use. I am so delighted to have received my window screen. I have fitted it myself and I am disabled and 85 years of age. The service I have had from Dominic was first class.nothing was to much trouble for him. Many thanks. Just to let you know the Flat Cats arrived today. They're fantastic, thank you! I'm sure I'll be back again for some more soon! Hi Dominic, our custom made Flat Cat arrived this morning - fitted within 15 minutes and is perfect. 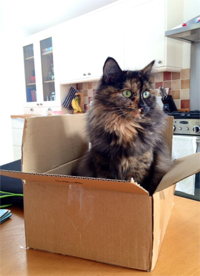 Our cat had a look at it but didn't try to get out and we are very very pleased with the service and the quality of the product. Will be ordering another size fairly soon for another window. Well done and thanks. We are extremely pleased with them, it took us matter of minutes to put them on and they work brilliantly. After almost of a year of not being able to open our windows what a peace of mind this is for us. Many thanks for your excellent and prompt customer service and for such a wonderful product. I have recommended you a couple of times now on my cat shelter and cat groups forums I frequent and hopefully some have contacted you for orders..i did notice a couple of people saying that they had your window guards as well and love them..THEY SHOULD DO THEY ARE FAB! We just wanted to drop you a line to say a huge thank you for our flat cats! We've had them for a couple of weeks now and they have been a godsend. 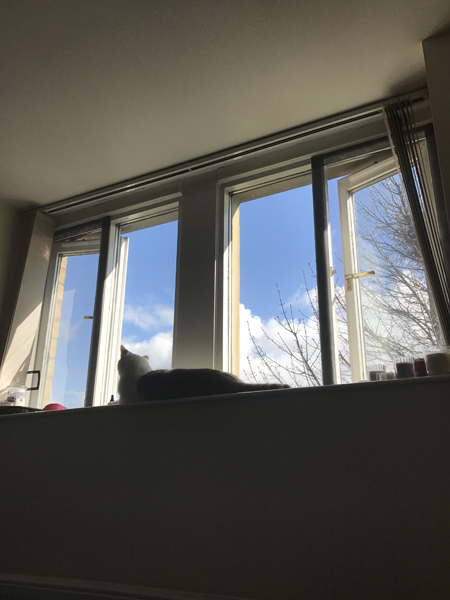 It's been so lovely to be open the windows in our flat without worrying for the first time in a year and a half since we had our cat. 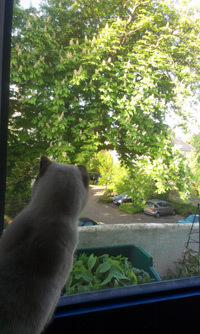 Our cat also loves it and sits by the open window sniffing the air and listening to the birds. 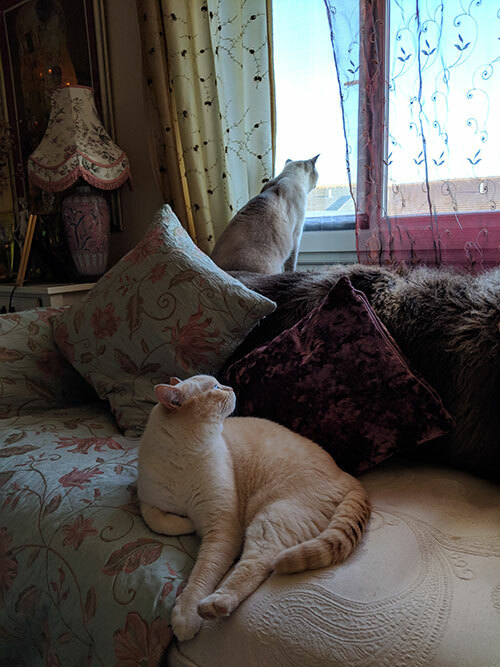 We wrote a review on Amazon not long after we received the flat cats but wanted to thank you personally for all of your help - it's much appreciated. We've also passed the website on to a couple of friends already! Received my order today thank-you. Had that up at my Daughter's bedroom window within 5 minutes. So lovely for her to get fresh air into her room without our 2 cats getting into trouble. Plus she is scared of creepy crawlies/flies etc. so stops them coming in! Win, win situation! We have one in our room that we purchased last year and very satisfied with that too. Hi Dominic, I am forever saying thank you to you, but i sincerely mean it so thank you again, my two cats Pickle and Barney are also grateful they now have so many windows to sit at and get fresh air in safety. I got the items today. They are fitted and I have to say they are fantastic! The peace of mind it's given me and it's made my house liveable without having to risk the cat escaping or worse having to rehome him! Cannot recommend your products enough and the turnaround has been timed so well that I can spend the first night in my house with the windows open (as it's roasting) and know the cat isn't going to get out! Thankyou so much!!! Many thanks for sending my two orders so promptly! I have had no trouble fixing them up to the windows, much easier than I dared hope, and they are working well - particularly in the bathrooms and bedrooms. I've yet to put them on the conservatory windows but I anticipate the cats will be delighted to be able to sniff the air properly! Thanks once again - a great product. I just attached the screen to my bedroom window. I love it! It is perfect and now I can open the window at night without worrying about my cat sitting in the window and pushing the other screen out. I will be ordering more screens soon! My screen arrived today. I installed in about ten minutes, very easy to fit, very clear instructions. I'm over the moon with it and my cat hasn't moved from it since I fitted it. It's so nice to have fresh air in the living room again, Stripes was hit by a car in January 2015 and has her leg pinned and plated together, and is only allowed in the garden when she is wearing her harness. Last summer was a tad on the stuffy side. I had spent ages Googling various screens and trying to find something that would allow us to have the door open without compromising Stripe's safety, and your product is just perfect. Greetings Dominic, We got there…Your parcel arrived this morning and the fitting was easy. So far, apart from a bit of cat'a'balling at the inside of the open window, all appears to be working as planned. So, fingers crossed (and everything else) doing business with you seems to have been money well spent. Just wanted to say thank you. My screens have been up for a week and my cats have not managed to pull them down. 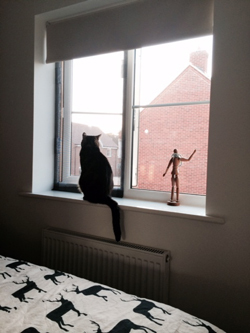 Hi Dominic - The Flat Cat arrived today and holding it up to the window it looks spot on! what service! in todays couldnt care less world.I will pass the word on to indoor cat owners that I know,All the very best and will be in touch when I decide the window in my sons bedroom needs your help.Thank you once again. We finally installed them and the cats love it. Many thanks again. Thank you so much for posting it so quickly. We received it yesterday and it is perfect! I have shared your website and facebook page on the breeders website and people have already commented on it. So hopefully you will get some more sales too! Thanks for sorting the order out for us. I have just finished the installation. Perfect fit! Just to let you know all 3 Flat Cats fitted a treat and are successfully installed. Thanks for your help. Dominic - to let you know we received the screen Saturday afternoon for our kitchen door I fitted it Sunday morning it dose the Job perfectly the wife is very pleased she can have the door open on warm day's while cooking thank you once again for your polite kind assistance. We've got the product last week, it fits perfectly. Thank you very much! Thank you for the screens! They are perfect! Thanks very much for the quick delivery. 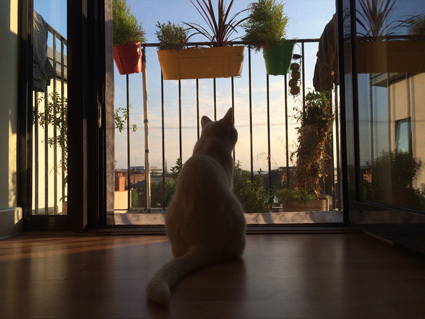 It's wonderful to able to get some fresh air in the flat during this heatwave! Thrilled with our order. Thank you! Hi Dominic, Just a quick email to say that these on Friday morning. Great quality, easy to install and very prompt service. Hi Dominic, I am delighted with my order and you were correct when you said they could be fitted in minutes. 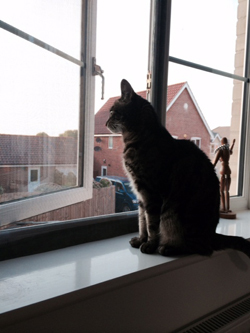 Bluebell is also happy that he can look out of an open window. Fantastic customer service and a fantastic product. Easy to fit and durable. My two cats totally ignore it now, and I'm loving the fresh air without worry. Would recommend this to all. Thank you for sending the Flat Cats so quickly. It went straight up a treat -wonderful. Thank you. The cats even enjoyed playing with the curly backing from the adhesive strips! Will shortly be in touch for the patio doors. P.S.Why dont you advertise yourself more Dominic? I only heard about you from the Vets notice board. Do you have any kind of flyers/posters I am a member of a Cat Rescue. We could distribute during our fundraising events. Perhaps you should go on Dragons Den? Hi Dominic, Just wanted to thank you for our order – just fitted it and thankfully it fits !!! Very pleased with it , cats haven’t taken any notice of it and are enjoying the fresh air. Received the flat cats today and have installed one already. Thanks again, delighted with it (& by the looks of it, so is she). Hi Dominic, Many thanks once again for the very efficient service. The packs were received and the Flat Cats are now in situ. So I am all prepared for the hot summer months ahead! A truly exceptional product. It has changed our lives. 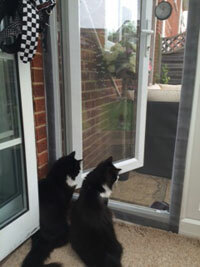 Fresh air for us, and Minnie and Marvin love to have the breeze through their fur. I ordered one to start with, and have just ordered two more. The flat-cat is a REALLY well made product. The mesh is tough and you cannot see it from the outside, and after a while cannot notice it at all. The fixings work perfectly and are quick to place. The customer service and care are excellent, the delivery is speedy, and my cats are safe. They have never tried to scratch at it or get out, they just really enjoy smelling what the neighbours are cooking for supper and being extra nosy. Thank you Dominic at Flat-cats. Hi Dominic, just a short message to say how delighted I am with my flat cats. I have two cats now, and I don't have any worries whatsoever with opening my Windows. 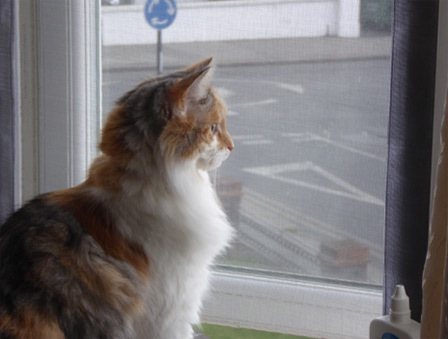 Every time I open or close my windows, I think to myself, those flat cats are absolutely marvellous, what ever would I have done without them. I constantly tell people about them and about your excellent service. Thank you once again. Thank you so much for your excellent speedy service! My Flat Cat arrived yesterday and I had the first decent night's sleep with the window open since the arrival of my furry baby! Fabulous product. You're a genius! Just wanted to say thanks for your help and the package as it has arrived and we've already put up one of the flat cats on one of the widows and it has been well received by our cat! Hi Dominic, I've suddenly been reminded that we never confirmed delivery of our Flat Cats; they arrived shortly your last email was sent. The Flat Cats fit the windows perfectly and the instructions that came with them couldn't have been clearer, so we had no trouble putting them up. After a day or so we both found that we hardly noticed them, and I still occasionally try to open a window without first unsticking the Flat Cat, a testament to how well they've blended against their background. Our new cat, Nigella, is a larger lady, so she hasn't been doing much jumping onto the windowsills yet, but she is very curious and once the diet we've got her on has produced results I've no doubt the Flat Cats will prove invaluable. In short, a top notch product, and a great service to boot. Once again, thank you so much. My husband bought flat cats from you a few months ago - they have made such a difference to us! We can now sleep with the windows open without our cat Pilau climbing in through the blinds! Thank you for an excellent product and great service. Dear Dominic, Just thought I'd take the time to thank you for your invention of Flat Cats. We have 2 black cats and live near a busy road, so they're not allowed out at night. One of them prefers windows to cat flaps, so without these, we would be unable to open our windows once they are shut in for the night. 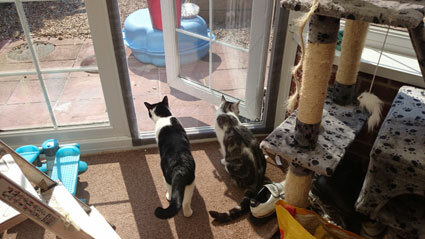 The boys also like them, as they can sit next to the window and sniff the outside world! 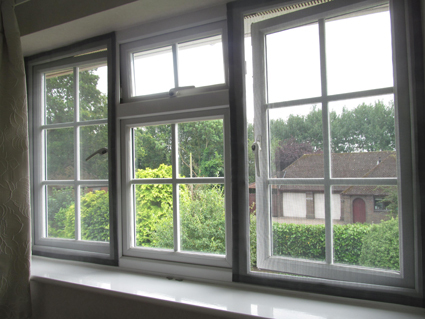 We have some from a few years ago, and these are much stronger, but again easy to install, and the measurements on the website easy to follow (the first lot we got we had to have one specially made for the study window which is larger than the usual, and you were particularly helpful then). So once again, thank you. Hi Dominic, Thank you so much for getting these flat cats to us so promptly. Finally we can have the windows open without worrying that the cat is going to fall out the window lol (See picture attached of what we have to deal with). These flat cats are a godsend and dealing with you has been a pleasure. Thank you so much, I will recommend you highly to anyone that has cats. I wanted to followup and let you know our Flat Cats package arrived today, and we promptly installed them. 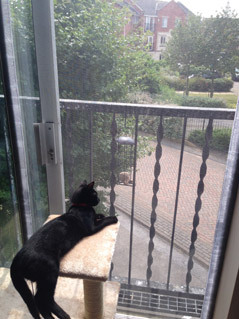 Attached, you can also see one of our cats enjoying the fresh air and Flat Cat. Thanks for all your responsive help, and look forward to seeing how this goes. Hi Dominic, well it’s been a few weeks since I fitted the three screens and I have to say, they’ve made such a difference to all our lives! A great invention and I’ve shared your website with all who will listen! Thank you again. Hi Dominic, Just to let you know they arrived safe and sound and they are perfect!! Exactly what we needed. I will be in touch next month as we need another one for a different sized window. Thank you again it’s a brilliant product!! Hi Dominic, Just wanted to say thanks so much for the speedy service. Did not expect the custom flat cat to arrive so quickly! It fits perfectly (bathroom window) and means I can now leave the window open to let the steam out without wondering if Abbey is going to make a run for it! Awesome product and I've been recommending you to all my friends with house cats! I have received the flat cats and in the process of fitting them. 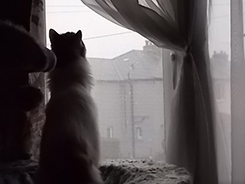 Thought you might like to see Claudia our cat enjoying the fresh air and watching the reason why I had to fit them (five very boisterous yard dogs!!). Everything fitting perfectly. Thank you once again for the fantastic flat cats window protection. As always my order arrived very promptly and was up in minutes as its such an easy to assemble product.On behalf of Amy and I, cant thank you enough for such a perfect service. Here is the little lady herself enjoying a snooze in the sun porch and in the flat cat box too. This just goes to show she loves all things flat cats, thank you. Dear Dominic, They arrived yesterday and I have just finished fitting them. A great product and just what I have been looking for! I live in a three storey town house so can now look forward to allowing the fresh air in whilst keeping my three cats safe. The added bonus is that they will keep out the wasps, of which I am petrified!! I will be recommending this product to my friends and neighbours. Thanks so much for the custom Flat Cats screen. 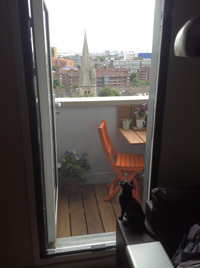 It's a perfect fit and I can, at last, have my French doors open onto the balcony without fear of my cats escaping. Fidget, the ginger one, launched at the screen after this picture was taken, and climbed all the way to the top. Realising he couldn't get the screen to come off the frame, he dropped tome floor and gave up trying. He is sitting at the front window instead now, which has the Flat Cats I bought a few years ago. I will always recommend your amazing product and service to friends and family. Thanks so much again. Wow, That's what I call service! Hi Dominic, All Screens present ,correct and fitted, Thank you once again for a wonderful service and correspondence, we are now considering having a couple of doors done ,but will be in touch about that later. Thanks once again. Hi Dominic, As I have house cats, I ordered two of your screens. I received my two cat flats this morning. Within minutes I have them up and working to let in the warm air and birdsong, but not the bees!! - They are fantastic!! - I shall order more, although I have a small window in one room so will need to measure it before I contact you again. Thank you, thank you! Oh that I knew about this years ago!! I just wanted to say Thank you for my Flat Cats! My kitty can now enjoy the fresh air and I'm not worried about her jumping out of the window! I will be ordering more! Thank you! Thank you for the flat cats, it's just great. It fits perfectly on both windows. My cats are enjoying having the windows and the back door open now the sun is shining and I am happy in the knowledge that they are safe. Your product is great it does exactly what you say. Thank you for your excellent service, Flat Cats received and ready to fit. This will put my wife’s mind to rest as at the end of summer last year we had a cat come into our bedroom via the garage roof and she has refused to have the bedroom windows open at night ever since, but with Flat cats problem should be solved. I just wanted to let you know the Flat Cats arrived and have been installed. They fit perfectly and I’m very very pleased, thank you. I would like to thank you again for being so helpful and kind with making these for me and my girls, Lola and Molly. An absolutely fantastic service from beginning to end that I won’t hesitate to recommend to all my friends. Thank you, we got it and it fits perfectly. the kittens love it too. Hi There, Just wanted to let you know that I have received and fitted my Flat Cats and to thank you once again for your excellent service and product. Hello, I'm just writing to say THANK YOU! The item is arrived on Monday, and on Monday night we had the house check. The volunteer was very impressed (she asked where it was coming from so she can suggest it to other people) and agree to let us adopt the kitten which will arrive today. Thank you for the fast service and the great item. Ilaria, Stefano and Gismo the cat. Fifi, with one of her custom made flat cats . Almost invisible, glad no other cats can get in either. I can still enjoy having door open in the summer too. Great customer service and easy to put up and use when needing to open door and windows. Speedy delivery as I ordered before the summer rush. Very impressed with this product as I was at a loose end how to keep an indoor cat and still be able to open my windows . 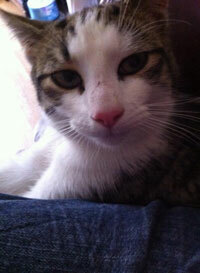 Dear Dominic, Thank you to you and all at Flat Cats for the very courteous, helpful and speedy service I received. 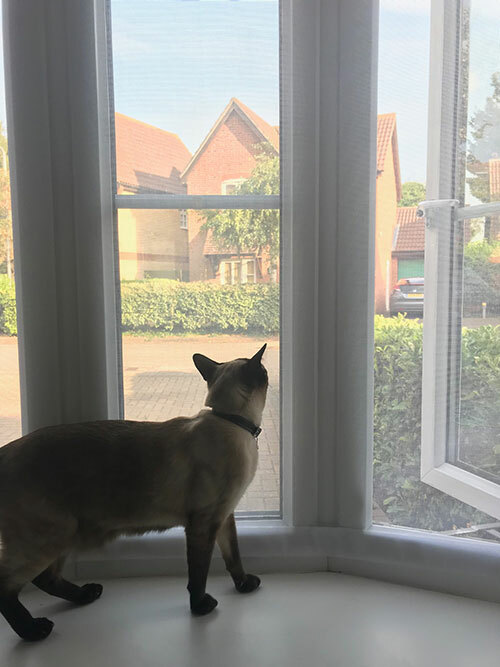 My cat screens are all now fitted and as you will see from the attached pictures Millie had a go to see if she could get out bit then decided to give it up as a bad job and now sits quite happily watching the world go by. Once again, thank you very much, I now have peace of mind that come the warmer months the windows can be left open and Millie is perfectly safe. I would not hesitate to recommend your services to others. My cats are very much enjoying the flat cats screen. The Flatcats door screen arrived this morning. 10 minutes later it was up and fitted!! 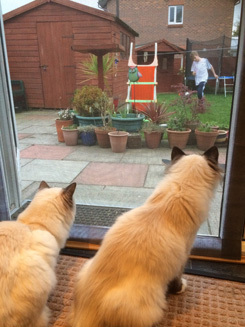 My 3 Burmese cats (an energetic breed) were sitting enjoying the fresh air and working out how they could escape. They prodded and pushed smelt and felt but then realised the screen was staying in place and so gave up and went about there cat business. So far a good result. Thank you for your help- easy to fit and a good product. When my new windows are fitted I will place a further order. Will also tell friends about Flatcats. sorry not to have added my thanks to all those positive messages before now. The screens have been brilliant over the summer and completely live up to the claims for the product. I was prompted to add my thanks for the product and the service when a visitor ased me about the screens and where to get them. I was able to wholeheartedly recommend your product and gave your contact details. So thankyou for an excellent service and best wishes. 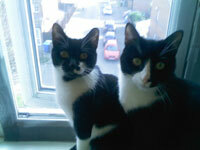 Hi Dominic, I did thank you when we got our Flat Cats, but feel I must get in touch again. Having the FCs in the hot summer we have had has made so much difference to us. The 2 kitchen ones ( room at front nearest drive to road) meant open windows,a cool room and no chance of our 2 cats getting out and the bedroom one (we are in a bungalow) stopped any muddy paws on bedding and no "presents" brought in. There is a cat flap at rear of bungalow for cats to go out. So thanks again for excellent product.. 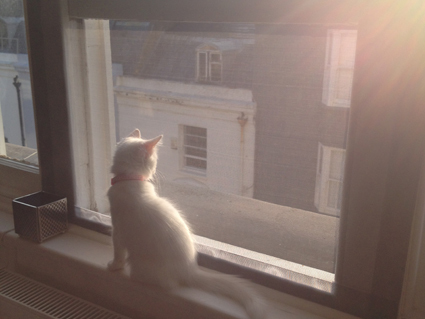 Thanks Dominic - my kitten sloth really enjoys watching the seagulls out of our window now. I do not know how to thank you! It has been the best service I have received in years! Thank you once again for being so nice!....I just forgot to mentioned that flat cats is a brilliant product! Very easy to fit ( I had more trouble to get right measurements :) It does its job perfectly. Thank you once again! Hi Dominic, We received you nets and fixed them today. Absolutely brilliant!!! My cats seem to be very happy with them. "Innovative product", they say. I will let their breeder know about your product as well. Thank you very much. They are great. I can let the air in and they love to lay by the windows, feeling the outdoor smells. And I have peace of mind. Brilliant! Thank you a LOT! Many thanks for my most recent order from Flat Cats! 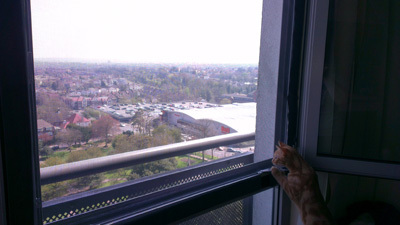 It fits perfectly and now gives me more options with allowing my little cat onto the balcony. Just to let you know we are really please with the Flat Cats! I have passed your details on to some of our staff members, who are interested in ordering. Hi Dominic, Flat Cats came today at 6pm, I put them up and were in use by 6.15pm. 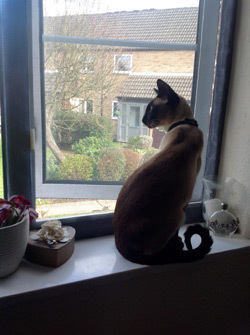 The Siamese is sitting with the wind blowing in his fur now :-). Thankyou for your help and excellent service . Wow! All arrived (amazing fast delivery!) just put first one up, brilliant product, will go back on website on weekend and leave review just wanted to say thanks for great service and product !! I received my flat cat windows nets week and a half ago. They have been successfully fitted an serving their purpose. Thank u so much for u r brilliant product. Good luck with your future business. 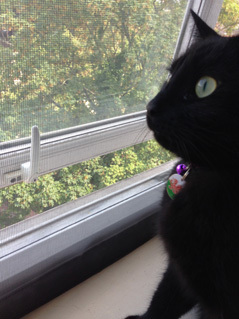 Hi, just wanted to say that your Flat Cats window screens have changed our lives and our cat’s too! With the hot weather we couldn’t open our windows for fear of losing our house cat but we ordered two flat cats and quickly ordered two more. 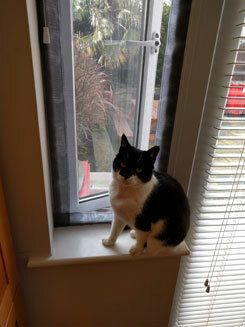 Our cat, Issey-Padstow, loves to sit by the now open but protected window watching out and taking the air. Brilliant product and nice friendly service. Thank you. Wow!! That was quick. Thank you so much. I’m so pleased with the Flat Cats. My daughter didn’t even notice I’d put them up. She remarked on how little the mesh affects the light throughput. Of course, and very importantly, the air flow through the windows/patio doors is still there. The kittens are now safe!! I cant thank you enough for the Flat Cats! They are such an excellent product. I was very wary of using anything, as I really didnt believe that it would be secure enough to keep my very playful cats on the inside...how little did I know! The service that you give is superb, the time to each customer, even when I made a mistake is second to none. I know one friend who has also used your service, she also sings your praises! Thank you, thank you...but mostly Willow & Spikey thank you! Thank you for this product! It has been unbearable having all the windows closed in this heat but now, as you can see, I get fresh air and Pugin gets to nose on the outside world! It didn't take me long to put up or long for the cat to start enjoying it! You provide a great efficient service. Sorry it’s taken me a while to respond but I just wanted to say thank you for my recent screen. It’s made summer much easier and, as you can see, it’s very effectively doing its job! Thank you once again for your much appreciated service! 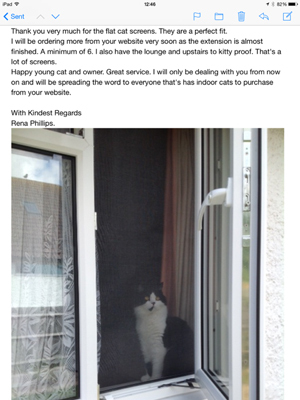 This is just a quick email to say thank you so much for the flat cat for my patio door! It was so easy to fit and did it in about 15 minutes! I can now have my door wide open knowing little Henry can't get out or hurt himself and as a bonus it stops the pesky flies getting in! I also just wanted to add thank you for being so reassuring and kind while I was on the phone to you! Fantastic service, fantastic product and fantastic delivery which got to me a day early!! Definitely going to order one for every window as soon as I can! A couple of pix of Miss Daisy wishing she could get out! The pix with the house in the background is taken from an upstairs window. Certainly the screens are doing their job. Just waiting for her to investigate how to get out! Just wanted to say a big thank you. My flat cats screen arrived yesterday and we set it up as soon as it arrived. Both cats have been very curious but have been well behaved, only one instance of paws on the screen so far. Its made such a difference to the temperaure and stuffiness of our house, making it so much more comfortable for us humans and furry ones! I'm attaching a pic so you can see them both having a good nosey. Thanks again for an amazing product. All received and fits perfect. Thankful for the cool breeze through my flat now. Just wanted to thankyou for all your help with my patio door cover , we have just fitted both door and window covers with ease , it is lovely to be able to have our patio door open again. Just to let you know that the window screens arrived today .I haven't fitted them yet but they are perfect for size.Thank you for all your help .I also wanted to say your website is very user friendly. Many thanks for dispatching the below so promptly - they are now in situ and seem to be doing a great job! - it's great to eliminate the insect visitors too, with the balmy weather we've been having this year. Our cat is VERY curious and is always exiting via the window ledges downstairs so your product has brought peace of mind for us with the upstairs ones. Apart from giving them a good sniff, she now seems to have accepted them as part of the furniture.................I will recommend wholeheartedly to my cat friends! Dear Flat Cats - Just wanted to say a huge thank you for my order which arrived very super quick. I can now open the window without the fear of my cat attempting to escape and venture out onto the window sill. I had the best night sleep in months with a nice cool breeze flowing through the bedroom which also stopped any insects flying in too. Something so simply yet effective is definitely a hero in my household.I've attached a picture for you. Thank you so much. Jaina and Bella the Cat! Hi Dominic, I just wanted to thank you for the flat cats - both the product and the service. The vet told me to keep my cat indoors for health reasons so I've had a lot of worry trying to stop him from jumping out of the window and getting badly injured again (he is a rescue cat who was hit by a car) As my cat is very inquisitive and fearless, my only option was to never open windows. I was impressed with the friendly customer service and the great deal that I was given on my 3 custom flat cats. My cat has only tried to climb them once and I was pleased to see that they were very sturdy. 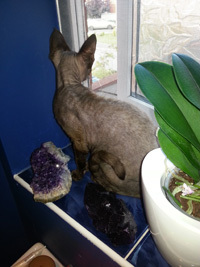 Ive sent a photo of my cat in his new favourite place, sitting on top of the toilet looking out of the open bathroom window!I'll be moving house soon and definitely ordering some more from you. I received my order yesterday and would like to a say a huge thank you! 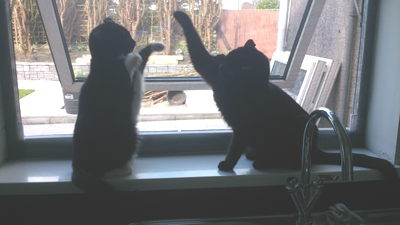 Maia and Ezio seem very happy to have a little nose out the windows. Maia jumped out the window which is the reason for my purchase. I'm first floor and thankfully she wasn't injured! Dear Dominic - I just wanted to let you know what a fantastic product you have. 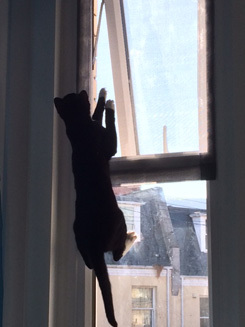 Our cat decided to start attempting to abscond out the windows a few weeks ago- just as the weather started to get hot hot hot. 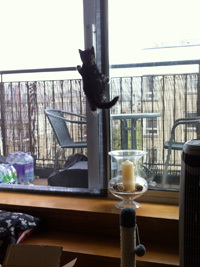 We've had to keep the windows closed for fear he might fall out (he's not the most dainty or co-ordinated boy!) and it has been unbearably hot. 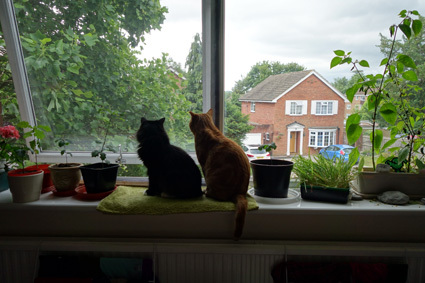 10 minutes after the postman delivered the Flat Cats, we have them fitted, the windows are wide open and we can have a fresh breeze without needing to wonder what the cat is up to. Thank you so much for an ingenious product! 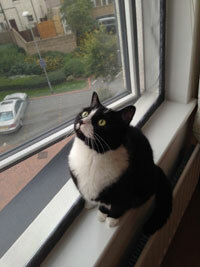 Hi Dominic - Just a note to say that the flat cat window covers are brilliant. Both are perfect fits and they've been an absolute god send given the weather of the last 2 weeks - I think we'd have cooked with the windows closed!! Hi Dominic, Many Many thanks for the flat cats, having bought from you before I knew they were excellent value and thanks for putting the narrow fixings on that go all the way around the window just that added protection is great as my female Sox loves nothing more that hanging on the screens. 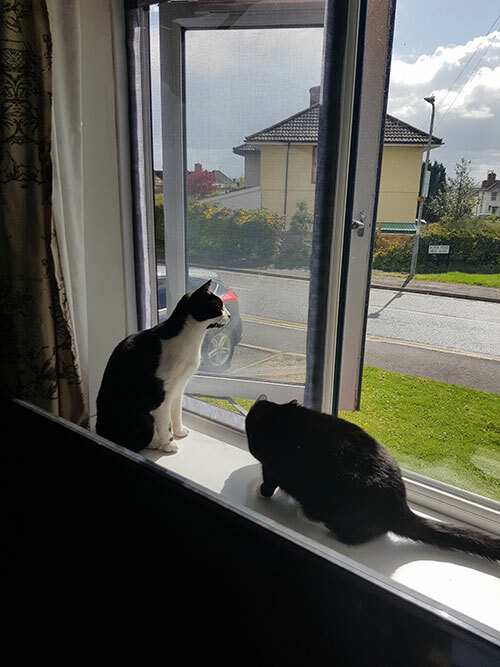 All my windows are now open wide so the air flow through the flat is lovely and will keep my two cats happy, they now don't know which window to sit at so they are checking them all out. The speedy delivery was excellent to as tomorrow is said to be the hottest so far and I am happy in the knowledge that my indoor cars will be safe and cool. I am know telling everyone I know who has cats to get them. Many thanks for the Flat Cats! I have now put them up and am relieved that I can have fresh air in my flat again. They fit perfectly. I will certainly recommend Flat Cats! Hi Dominic, I just wanted to write and say thank you so much for changing our flat cats and sending us custom made ones, they are superb, a really excellent,well made product and your customer service is fantastic. I like to give credit where it is due and have been recommending you to other people I know. One lady asked on Facebook where she could buy window screens from and I told her she should definitely contact you because I am so impressed with your product and service. Thank you so much again. Just wanted to email to say thank you so much for my order. 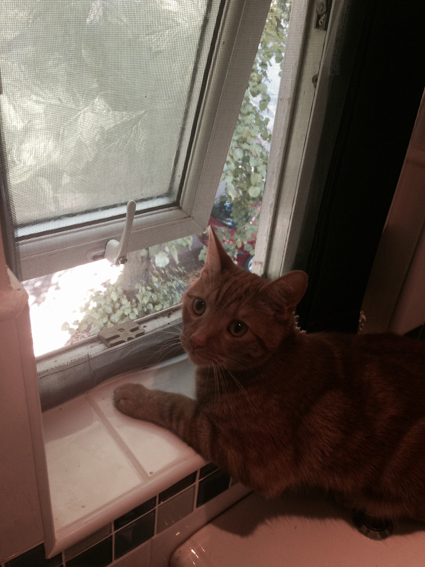 My cat has never been so happy (unless he's been on the catnip) to sit on the window sill. The night I put them up he was staring out of the window for 3 hours. They are so easy to put up especially with help from my cat. He's also jumped up on them trying to catch birds outside and they haven't even shifted. This is the best thing I have ever bought and I'll definitely passing this on to all of my cat crazy friends. Just to let you know the cat flats arrived and I installed them very easily she has only gone bonzi and ran at the screen door once and she bounced right off lol. I can now open my patio door snd bedroom window without the fear of her getting out. Hi Dominic, I hope you're well! I just wanted to drop you a quick line to say thanks so much for the Flat Cats - they work a treat and so wonderful to be able to have our windows open again! Our boys do go out during the day but we get them in at dusk so they both enjoy sitting at the windows in the evening now. A brilliant invention and a must for cat owners! Hi there, just to let you know I have the screens fitted now. Leah (the cat) doesn't seem too impressed with them. Don't really mind though as I can have nice cool air circulating in my bedroom without worrying about her falling out. Thanks again. 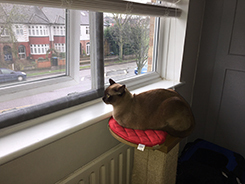 Hi Dominic, I just wanted to say thank you very much for our flat cat which was delivered last weekend :-) it fits the window perfectly & our mogsters can sniff the fresh air whilst safety contained in the flat! Means that we'll be able to open the window a little wider than previously :-) & the box was an added bonus for our little princess lady cat Skye :-) Thanks again, if we need any more in the future, we'll be in touch. Hi Dominic, Just wanted to let you know how happy I am with Flat Cats! They have been up now for a few weeks and it's been lovely to have been able to leave the windows open without fear of a cat falling out of it! They are sturdy products, I have had one of the cats climbing it and it held very well under her weight. She is not a very big cat but she does weight between 7 or 9 pounds (haven't weight her recently). Also reading in bed at night, without being visited by giant moths and various buzzy creatures coming in from the garden, is a big plus! Dear Dominic, Sorry it's taken me a few weeks to reply, but I just wanted to send a note to say thank you so much for the Flat Cats, which arrived perfectly (and quickly! thank you!) and most importantly fit perfectly!! - Really appreciate you spending the time to talk me through it all on the phone and for recommending the narrower fixings, they work perfectly with my window frames. - It's so lovely to have the windows open and not be permanently terrified that Polly will fall out! She's had a bit of a sniff at the Flat Cats, pawed them a bit to see what they feel like and now just completely ignores them. - I told a work colleague about them and although she doesn't have cats, she's thinking they might be a perfect solution to some "challenges" she has with insects at her holiday home in France, so she may be in touch! Thank you again - such a brilliant product and thanks for the wonderful customer service, I am genuinely really happy to have found a friendly, British company with personal customer service, such a change from the robotic conglomerates! Just wanted to say thank you - my flat cat arrived today and fits the door beautifully! I am now sitting with the door open knowing my fur babies cannot get out. It all arrived yesterday and we are really really delighted with it - though we have lost our dinner table to our sunbathing cats! It's perfect and we shall no doubt recommend it to other people! Dear Dominic, I'm glad to inform you that the three protection arrived yesterday, they are really sturdy and easy to apply, I think they'll work great for a long time, so thank you again for your assistance and I will surely recommend your website to anyone who should need them. Received our flat cats order earlier. 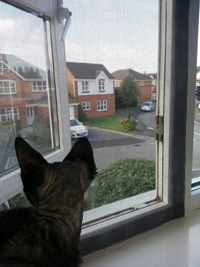 Works perfectly thanks, thought you might like a picture of Loki enjoying some fresh air and watching the birds. Just wanted to say many thanks again for your great service. The flat cats came Saturday morning and I fitted them all Saturday afternoon. I will be need some more for the rest of the rooms soon. You so already have a picture of my cat enjoying them from about a year or so ago, but if you want another more updated one to put on your website then please let me know. Thank you so much for the swift delivery of the three screens for my Mum. I fitted them quite quickly yesterday and she's thrilled! Her cat, Bertie, is not particularly interested, which is great. We'll see if that changes. We may well be getting in touch for more, as her bungalow gets very hot when the sun shines, and she can't open windows for fear of the cat climbing out. Your screens are a godsend. Excellent service, and it looks like the product is pretty good too, at this stage....thank you. Once again very happy with both the product and the excellent service. Say it every time but I don't plan on moving again but if I do I shall be back to you again. Just wanted to say a big thank you for my latest flat cats order and also for the essentials pack which arrived today. I am so impressed with the product and recommend you all the time. What a difference it makes being able to have doors and windows open in the warm weather and knowing your cats are safe and sound. My cats are happy and I'm happy! Also, have to mention your incredible service and quick delivery, keep up the good work. Dear Dominic, Thank you so much for all your help with my order for the cat screens and thank you for sending them so promptly! They work WONDERFULLY and serve a double purpose keeping my cats IN and any flying insects OUT...don't know how we would have managed because with this lovely hot weather we have to have the windows open! Thanks for latest Flat Cat. this is just what we needed to our bedroom window [in bungalow ] to stop cats getting mud etc.on bedding and also to stop them bringing in "presents"for us. Hi there, got my flat cat pack and it is great I will be ordering more soon I can leave my window open when in my garden knowing my cats are safe. 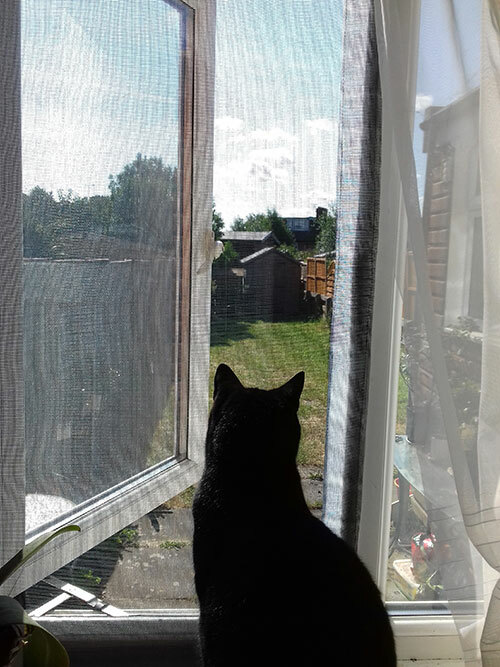 Just wanted to say thank you for the flat cats - they fitted perfectly and we'll really grateful to be able to open more windows in this hot weather!! Thank you so much for getting them to us so quickly. It's not often that you get great customer service in this day and age so I'm so grateful for the extra length you went to to ensure that I got a naughty-cat-proof product. I have been recommending your product to everyone I know that has a car so hopefully you get more business somehow! In the future I hope to order more for other windows in the house especially if this hot weather continues so once I have a bit more cash I'll be in touch. Wishing you all the very best and thanks once again for your excellent customer service. 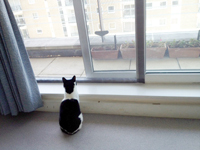 Dear Flat Cats, Just wanted to Thankyou for my flat cat window screens which arrived today. They are perfect, really easy to fit, and after a good inspection, it was decided by my two burmese girls that they were escape proof! They are very cross! Hi Dominic, Just to say thank-you for the prompt delivery of the screen for our back door. We put it up straight away and we are all feeling the benefits of having the door open and knowing that Rocky is safe. The instructions were fantastic and we had it up and in use within minutes. Thank you! Very pleased! Fresh air at last for me & two cats! Hi Dominic, Thank you for the speedy delivery. 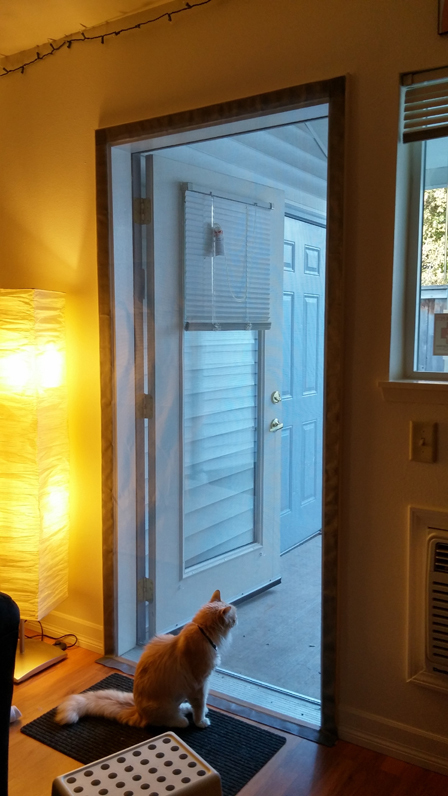 The flat cat for the patio door fits perfect. Marble does seem to like climbing up it but it is very strong and stayed in place. Nice to enjoy the fresh air again. Thanks. Really pleased with the Flat-cats on mum's windows. Excellent results and exemplary service. Thank you very much. Thanks for the super speedy delivery - I was surprised to have received them so quickly! I put them up immediately, no fuss whatsoever. Attached is a photo for your client testimonials - last week Penelope squeezed through the window when it was ever so slightly open, jumped down one story to the street and went for a walk towards a very busy road. Here she is, safely inside the flat, protected by the Flat Cat. 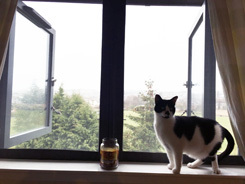 This is a must for all owners of indoor cats who still want to be able to open their windows! Hi Dominic, just to say a big Thank You for sorting out my order so quickly. Got them at work today and my first window is done. It was so easy to fit, and it's just lovely having the kitchen window finally open! 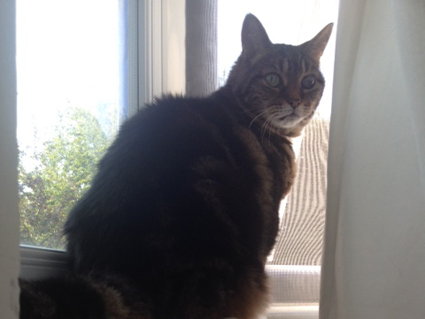 My cat, Mickey, has been sitting on the sill getting some air. Have already recommended them to a friend.Brilliant idea, thank you again. I’ve just received my Flat Cats delivery, the four of them fit perfectly. I haven’t installed them as yet, kittens are arriving early July but I’l be ready in plenty of time for them. I’ll send you some pics and further feedback when i go “live”/ I must say that are are superb, they cut out very little light, you can see quite clearly through them and they are made extremely well. 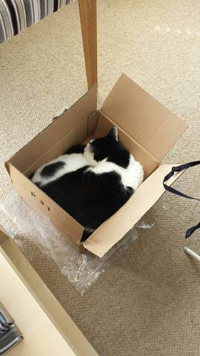 Hi Dominic, we received parcel on Friday and flat cats are now installed. 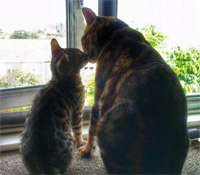 My husband and I are very pleased with them, they do exactly what you say they will, that is keep cats safely inside. Mo & Jo[ the cats] can go outside the back of our property via a cat flap, but now they will not be able to jump out of the windows onto the front of the house. Thanks again for all your help in sizing,etc..My daughter-in-law thinks they are so good that she is going to see if you can help help her with a flat cat for a patio door. Once again thanks very much, they are a great product. The screens have now been fitted and hardly notice. Thank you for your good service. Hi Dominic, Just to let you know that the flat-cat arrived today. We have not attached it to the door yet as our kitten does not arrive till July! But we have held it up against the door and it looks like it will fit fine. Thank you for all your help and fast communication. I shall be recommending you to anyone with a feline friend!! I collected my Flat Cats from the Post Office today and I fitted them earlier this evening. All I can say is WOW! What a fantastic invention - this is going to make such a difference to me, Hector and Pixie! I cannot thank you enough for your help, generosity and amazing service, I am truly overwhelmed by it all. I volunteer at an animal sanctuary in Sale (the Society for Abandoned Animals) and I shall be promoting your website on our Facebook page and I do hope it generates some business for you, you deserve it. 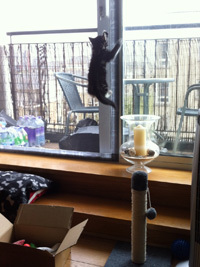 I have attached a couple of photos of Hector and Pixie exploring their Flat Cat! With very best wishes and thank you so much. Thought you might like to see our recently purchased Flat Cats product in action. This is our little boy cat, Domino, enjoying an upstairs breeze for the very first time! One of our cats once jumped out of an upstairs window (it's ok, she wasn't hurt) and since then we've been too afraid to open the upstairs windows up properly. But now thanks to your product we can have our upstairs windows open again! It'll make such a difference this summer I can tell you! Hi Dominic! My husband and I want to thank you for such a wonderful product! 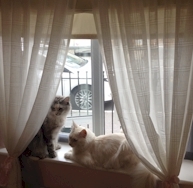 I'm leaving a picture of Pi and Neko sitting in front one of their 'Flat Cat' windows. Glorious! I'm from Florida and use to having screens on all the windows. Since being in the UK it has been quite frustrating until I came across your wonderful product P.S. Thank you for the fantastic customer services! Dominic I have to say the product you have is fantastic and good value for the money.I plan to have all my windows screened as i have been looking for this type of product for years. I lived in the U.S many years ago and all homes come with screened windows Sadly not here in the U.K We are so happy with this product Will be in touch soon as i have the funds for more screens. Hi Dominic, thanks for the wonderful screens..We like them so much we would like to order another one if possible! Many thanks for your help and for such a great product- I have been recommending your site to everyone! I just wanted to thank you for our custom made flat cats!! They were sent to us so quickly and fit the windows perfectly! I couldn't face another summer of the windows being shut in our flat- especially being pregnant this summer!!! 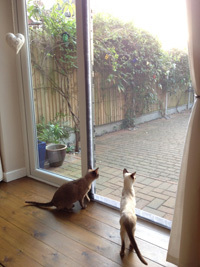 The cats love them as they can feel the fresh air and hear all these new noises! Will definitely be ordering some more in the future and recommending to my friends and family! Many thanks again!!! Thanks for the speedy delivery - these have worked absolutely perfect for me! Very happy and will recommend to all! 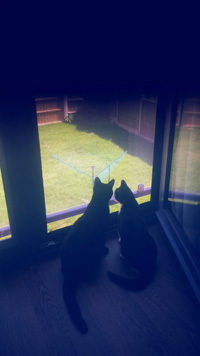 A couple of pics (though not great) of Lokie and Keeta looking out the window. Was so funny watching their reactions as they could sit and smell outside and listen to all going on – they loved it! Many thanks – and it was fantastic to have all the windows open yesterday, and enjoy the breeze and not have to worry about my cats! Hi Dominic, Just wanted to thank you for your excellent customer service and speed of delivery. The product is great and the cats love it. I've attached a few pictures for you. As you can see they look great!! I thought the least I could do is send you a picture taken a few weeks ago of our two cats who are now just about 2 1/2 alive and kicking thanks in part to Flat Cats. They are brother and sister the large one, on the right the boy is London and the little girl is Paris. Please feel free to use there picture and my thanks on your web page. also I would like to thank the person who I spoke to regarding my custom FLAT CAT he was a huge help and very pleasant to talk to and very very helpful in understanding the query that I had, as for the screen I can honestly say I feel much better knowing that I can have my windows open without having to keep my cat out of the living room just in case she jumps through the window, now It gives us a more secure feeling knowing she is safe. thanks for all your help and I can guarantee I WILL be ordering another one very soon. Just wanted to say thank you for my Flat Cats screen which I fitted this morning. It is a bright, warm, sunny day and I can now have a window open. Very easy to fit and very effective! I shall be sending you an order for another window, when, of course, I will be a normal customer! Thank you.... such a simple idea and it works very well! Dear Dominic, Flat cats arrived, fitted and magic (again). Thank you very much for your prompt and efficient service. We'll certainly be recommending flat cats and may even be back to you again. Hi Dominic, Just wanted to say thank you once again. I finally got some time to put the flat cat's on the windows! It's gotten really warm the last few days and my flat has felt like a sauna without the windows open and I'm way too paranoid to open them at all without the flat cat's up after Sophie's accident. Also, Sophie's accident turned out to be worse than the vet initially thought. When she went to the vets again on the Monday afternoon she was limping a lot on one of her front legs and they did an xray and found out she'd broken her leg and had to have surgery to put pins in it. When we went to the vets again today for a bandage change he told me that while the bandage was off she was putting pressure on her leg and trying to walk using it so he's fairly certain she's recovering well. She's also had to have cage rest since her surgery which she's absolutely hating, but it's for the best and stops her jumping around and delaying the healing. I'm so thankful I have pet insurance because the vet said without the surgery it's unlikely the bone would fuse back together correctly and the leg would need to be amputated, and I'd feel even more guilty than I already do if she had to have the leg removed. It's already come close to £2000 for the treatment and without pet insurance I'd not be able to afford that.. 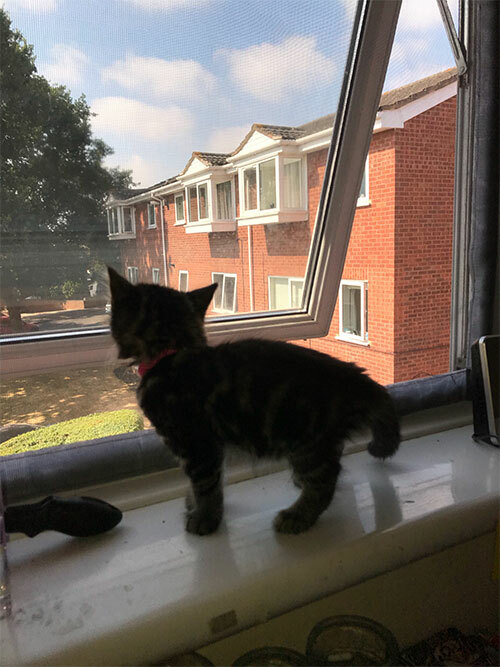 Right now Chloe is sitting on the window ledge looking out of the window and enjoying the fresh air, and it's also so nice for me to be able to cool down my flat a little! Thanks for the window mesh! They fit perfectly! 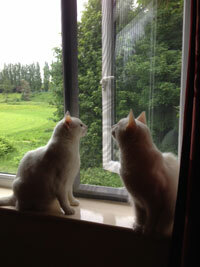 It was lovely to see the cats by the window feeling the breeze and hearing all the sounds. Good Morning Dominic, The nets arrived last weeks and took no time at all to set up over the weekend. Thank you for your time and help over the phone. All arrived yesterday (01 Mar) safe and sound. Pepper likes the box too. I just wanted to say thank you. I received a card on Friday but haven't had chance to collect them from the post office yet, which I'll do tomorrow. Today there was a bit of an accident with Sophie. I had a window open slightly and forgot to close it when I left the room. 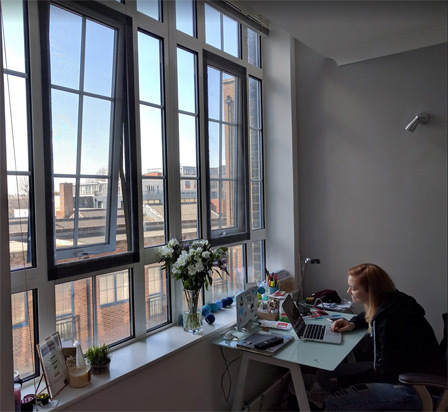 I live in a house converted to flats and it's like a converted attic and I couldn't find where Sophie was and saw the window wider open which must have been either the wind or pushed open by her, and she must have either jumped or fallen from the roof. I rushed outside to find her in the garden very scared and when I brought her back in and she was limping a lot so I took her to an emergency vet. Nothing is broken though luckily but she's a little sore and shaken up by the whole experience. I'm so glad you invented flat cats so nothing like this will ever happen to my cat's again. I spent the whole time from when it happened until the vet checked her over in tears. You said in your video that you wondered if you were just being over protective, but I know now that windows are a real risk and using flat cat's isn't being over protective. I think anyone living in a flat should purchase flat cats. When I do some day move house or the flat cat's get worn out, I'll definitely be buying more, because my cat's safety is worth any amount money. If you want to use any of this email on your website to let others know how important it is to protect their cat's from the danger of open windows you're welcome to. I feel so stupid for leaving the window open. I've never forgotten to close the windows until now and this one time the worst case scenario did happen. 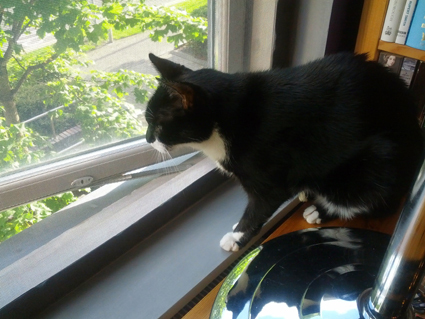 I thought you might like to see my cat enjoying his first "flat-cat" window last summer (attached). I'll be back for more shortly! Hi Dominic, Just wanted to let you know that I received the Flat Cat a few days ago and it's fits perfectly. It's really well made, thanks! I just wanted to say a big Thank You for my Flat Cats which I have just installed. Your customer service has been fantastic and the product matches up to it! I am an active member on several pet related forums and will put posts up to recommend your company. I just wanted to say a big thank you for the creation of Flat Cats and the fast turnaround of the order I placed. These are now on the windows and have been a roaring success. None of my cats have managed to damage or remove them and my house is now nicely aired. I no longer have to worry about them attempting daredevil stunts on the roofs. I have also taken the liberty of reviewing your product on Dooyoo - here is the link. I hope many more cat owners try these for themselves. ...and look, shes loving her flat cats. A perfect fit as always. Last night I put them on, opened the windows and let her see a big African thunderstorm. She thought life had suddenly turned into an HD action film :) shes loving the new smells and sounds, a very purry happy cat indeed! Thank you so much for the bespoke flatcats window covers. As you can see, Faith is unable to escape and we have air! Will be needing two more of these as I stupidly thought front and back windows were the same. Oh well, was going to order them at some point anyway. Will do a couple of art sales soon so will have some readies. Shall also be doing a blog and will forward you the link for your site. Just great. Perfect fit. I just wanted to say thanks so much for helping me to get my flat cat ordered in time before I went away. I appreciate the hurried delivery, thanks so much. The product was super and my mum's bedroom was transformed into a makeshift cattery, complete with fresh air, whilst I was away. My plan worked a treat! A great product and my mum is keeping it up as a fly screen! Just to say these are purrfect! Looking after daughters cat while they're on holiday. Whole problem of me loving fresh air in combined with not really wanting cat out..solved! You hardly notice them..very impressed! The Flat Cats are Fantastic. Both cats took to them straightaway. The more inquisitive of our two, just had one or two gentle scratches at the first one we put up - no damage done and after all cat flaps were accepted by them. Safe cats and fresh, cooling air up and down stairs. Thank you for sending them! They are great and working really well! Just to let you know - it arrived ok and is working well. We may be back to order a couple of window sections in September. We received our flat cats this morning, they are fantastic, it's made our lives a lot easier and it has been so nice to let the fresh air in, and not worry about the cats getting out. I'm just dropping you an email to let you know we have recieved our Flat Cat and are very happy with it, it fits perfectly and you can hardly see it! Monkey is loving having the door open, and hasn't tried climbing it either, which is perhaps the only thing in the flat that he hasn't! Thanks again for the great service and speedy delivery. I know you have been busy. Feel free to use this and the picture on your website reviews. Received the Flat Cats today and fitted them. It was really easy and I am extremely pleased with them. The two cats and their kittens I foster for the RCPA are getting lots of fresh air and they are safe from falling out my two bedroom windows. Thank you so much for your brilliant idea. Just wanted to say our flat-cats arrived this morning. We have two cats who have been very badly treated in the past and this has left them very scared, particularly of humans (except us) so they are unable to go outside, which to us has always felt a shame. 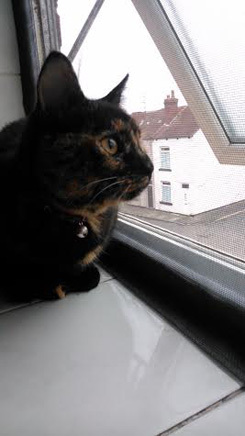 However, we now have two very happy cats, particularly our female who contentedly sits on the window seal up against the flat-cat watching the birds and butterflies and enjoying the fresh air. Two happy cats make for two happy humans! Good morning Mr Parker, I just wanted to contact you to say how delighted I am with my two flat cats! They fit perfectly at my windows and my cat Charlie really isnt bothered by them. The flat is lovely and cool now, I really wonder how I coped before. Your advice about the sticking strips was perfect too as the screens really fit snug and secure. If you ever have someone asking questions about your product and if it works, would be happy to confirm its fantastic! I don't know if you have a customer review section on your site but I'd just like to say how pleased I am with your products. I have 1 little cat and she won't try and chew them or claw them or anything like that to get out, just sits and enjoys the breeze which has been so important at this hot time of the year. Cannot thank you enough! Iincredibly impressed. Would and will recommend you to others. 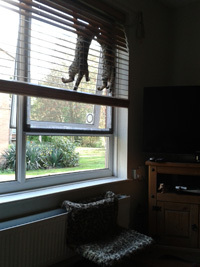 Hi, just wanted to say a huge thank you from my Bengal boys they can now happily window gaze with a cool breeze. Flat cats is truly an amazing product and we will be measuring up for some custom sizes very soon!! Thanks for the recent custom Flat Cats order fits perfectly, brilliant. Hello Dominic, We just wanted to say thank you for the three flat cats we ordered. They arrived last Friday well packaged. 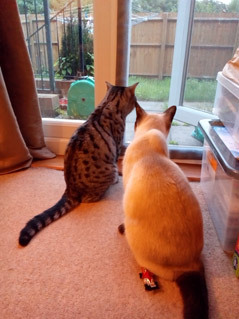 We are very pleased to report that they are working very well for our Bengal cats. I have attached a photograph to show how pleased they are with them. I just wanted to thank you for my order, it arrived today and is already being put to use! It fits perfectly. 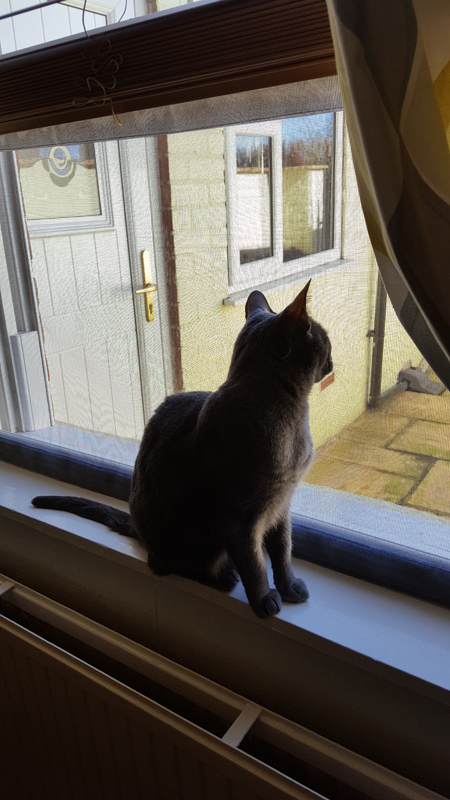 Our small accident prone younger cat is enjoying a breeze safely and our older cat (terrified of the outside world) is enjoying fresh air from what she considers to be a safe distance about two foot away. Here's a couple of quick photos from my phone, my dSLR battery is on charge so I'll send you any other better ones I may snap incase you want to use them on your site. They arrived and are absolutely brilliant. The house is now cool and house cat Mr Shinto is safe. Can I just say a massive thank you for such fab service. The flat cats arrived this morning and are perfect! 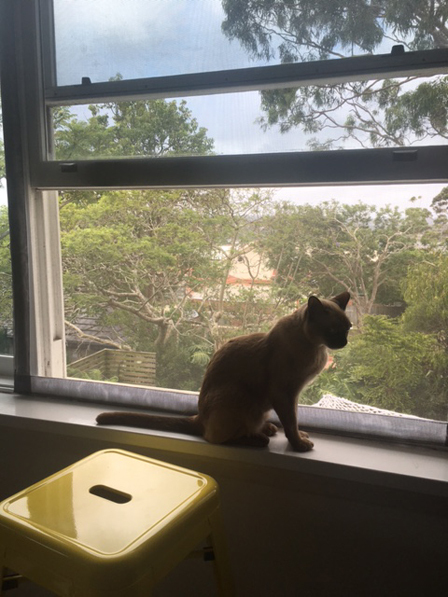 We can finally have our bedroom windows open at night without the risk of Lola jumping out. Flat cats received and one is up its brilliant thank you. When I move again I will be ordering more!!! Just to confirm our order arrived this morning and is already in place! Thank goodness as today is looking to be a hot one (and I was worried that by ordering these I had put an end to any more hot days this summer!). As an added bonus, it looks like the Flat Cats will prove good spider deterrents too – at last my son will be able to sleep with his window open (he’s 18). Hi Dom, I received my flat cats today,fitted in an instant and it works a treat.i have left you a message on Facebook .many thanks and good look for the future. Just to let you know i have received my Flat Cats this morning and half of them are up already! Thanks for your speedy service. Dear Dominic. 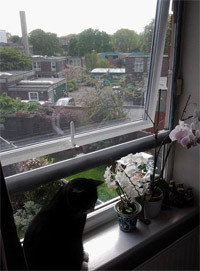 Just to confirm that my Flat cats pack arrived yesterday and as you can see from attached photo - my little rescue cat Caesar took to it immediately, spending the evening on guard duty at the window! We live in a 2nd / 3rd floor apartment and I think he will never be brave enough to go out so your screens are ideal - what a good idea! 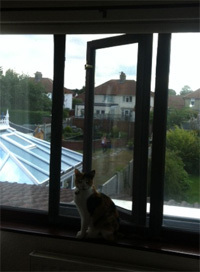 Just to say that flatcats arrived and fitted to windows. Very pleased with product. As well as cat safety it's stopping pigeons and moths coming in and plants from falling out! Very good service and I will definitely recommend you. 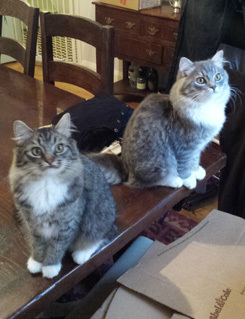 Hi, just wanted to say Thank You so much for our custom Flat-Cats! You have made them perfectly. 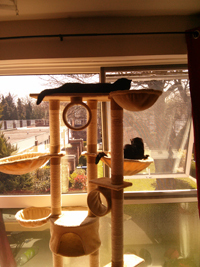 I recieved my flat cats yesterday and they are up and in use. I just wanted to thank you for such a good shopping experience and to tell you how pleased I am with your product, they work brilliantly and fit perfectly. Many thanks and best wishes. Thanks Dominic, it's just what I wanted! Now waiting for another really hot day so I can have a cool bedroom with the window open and no visitations from neighbouring cats. Will recommend to you other bungalow dwellers. Thanks again for speedy, personal service. Just wanted to show you that the flat cat is up and seems to be doing its job! Many thanks for our flat cat. We are very pleased with it and cannot commend your service enough, for a custom size we were pleasantly surprised to receive it so promptly. Thanks Dominic, They arrived yesterday. I received them after work and had them in place by 7pm. I cannot thank you enough for your brilliant service. I have already been “ spreading the word” so hope that you manage to get more orders through my recommendation. The fit is excellent, particularly considering that my windows have handles which protrude very close to the corner of the windows. I will attach a photo to illustrate how well they fit. I am glad that I went with the 50mm fixings as it allows me to get plenty of “ contact” in the corners next to the handles. I had looked, on the net, at a couple of much more expensive and more ”rigid“ alternatives to the Flat Cats and I am confident that neither of them would have done the job anything like as well. You have a very satisfied customer. Just letting you know the new set arrived this morning and they fit perfectly, we don't feel like we're trapped in a third floor greenhouse any more! Thanks so much for your kindness, you don't know how much it's appreciated. I'll certainly recommend your site to everyone. Sorry it's taken me a while but wanted to say thank you for the flat cat :). As luck would have it the day it arrived the weather has changed and gone rather bad so had no chance to try it for a week or so ... But I can now report that it fits and works perfectly and Phoebe loves it! A huge thank you. I have recived my Flat Cats today, excellent quality and so easy to fit. Thank you for your fantastic customer care. Just wanted to let you know I received them yesterday, I am very impressed! Humphrey (kitten) has not moved from the window since I put them up and loves feeling the breeze through his whiskers :) but most importantly I am completely confident that he can't get out! Also thank you for helping with sizes. I shall definitely be buying more for rest of windows. Just to let you know I bought a custom flat cat from you about a month ago. I bought this for a very different reason to most of your customers, it was for keeping my cat out. My cat is a constant hunter and during the night he will jump out the top window onto our extension roof and he has been known to jump back in with a dead rat in his mouth. Needless to say I had to keep the window permanently shut. I debated as to whether your flat cat would work and I'm pleased to say that it's fantastic. He doesn't try to jump in or out the window anymore. I'm so pleased to be able to have my window open at night again. Just thought you might be interested in case you ever had any queries asking if your product was suitable for keeping card out. Thank you so much. 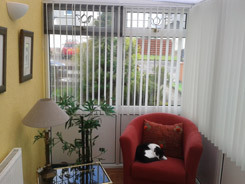 Just to say thank u sooooooo much for my fantastic Flat Cats they fitted really easily and are purfect, excuse the pun. Teddie my 6 month old Bengal kitten is in heaven. sniffing the fresh air in safety. Custom made to my sizes they are exactly right. Thank u for great product and customer service. 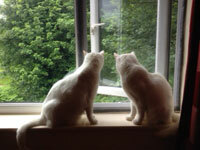 Just an e-mail to say thanks for shipping the Flat Cats so quickly, they fitted perfectly and make such a difference to be able to have the windows open safely in the warmer weather, Thanks again. All perfect - Mooch not impressed but I am! I've been howled at a lot today. Will be ordering more for the other windows once I get round to measuring. Flat Cats working well in Bromley for "Mooch"
We received the flat cats today. They really are great. I've attached a picture to show one of my cats enjoying it too. Want to say a big thank you for my Flat Cat. 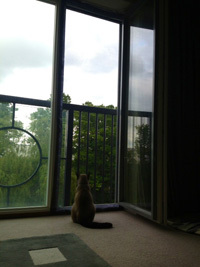 My cat loves it, sits in front of it and look at the world. And I don't have to worry that it might escape. I will recommend to my cat owners' friends. Mr Bibbins and Wilf say thank you very much for their lovely fresh air, they're just trying to figure out how to get past that pesky netting! 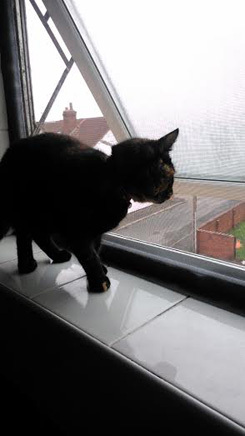 Put both flat cats up, Lola blue is investigating the bedroom one but its v nice having fresh air in the flat as have both windows open in lounge & flat and haven't been ale to do that for a while. Thanks. Hi Dominic, Just wanted to say thank you so much for the help you gave me with this, your customer service was 100% brilliant from start to finish. The screens look fantastic, the quality is great and I couldn't be happier - and neither could the kittens! They are definitely Bengal proof! Thank you so much again. I won't hesitate to recommend Flat Cats to anyone. Just wanted to say that the Flat cat arrives in very good time and we are really pleased with it! Our two kittens are safe and well in our flat! Thunder in particular has used it to scale the window! Gave us a fright but the Flat Cat didnt move! When we return to the UK we will be ordering more for our UK place! I just wanted to let you know, we received the flat cats today and fitted them all without a problem. I've attached a picture of the boys enjoying them already. Two very happy cats and two very happy owners! Thanks for all your help. I'll definitely be passing your name on. I've already been bragging about them on facebook this morning! Once again, thank you for inventing Flat Cats and making them available for the needy. By the way, the builder who is responsible for managing this rental property saw it the other day, and was full of praise - said it was very professional, attractive, and found the solution pretty ingenious. So there you go - your karma is good. Wow! What a relief your invention is!! It arrived today and it's just taken me all of 5 minutes to fit! 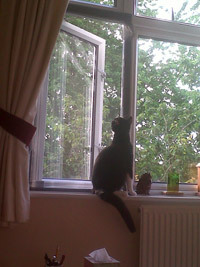 Splat is obsessed with the sights and smells I doubt I'll get her down from the window now! Just wanted to let you know that we received the Flat Cats yesterday. 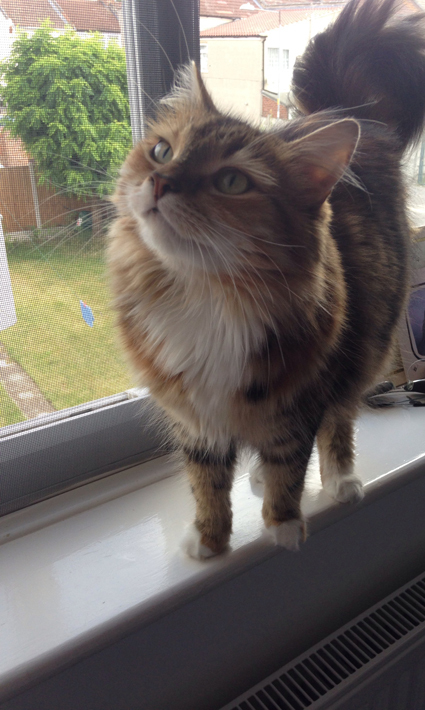 They fit brilliantly, Mia is happy to sit on the window sill and watch the world go by and my partner and I no longer feel as if we are living in a sauna! Thank you so much for all you help and advice, it is very much appreciated and I will have no hesitation in recommending you. FlatCat arrived and its perfect down to the mm! Kitty is really loving the breeze as you can see :-) I really do love them, its such a simple clever thing that makes a real difference to my cats day, as she is home alone and pretty bored until i get back so she loves spying on the neighbours now :) Someone from the cat charity i do work for ordered day before yesterday as well, he will be super impressed! they arrived today...thank u so much :o) love them!! Just to let you know that our Flat Cats are now all in place & working perfectly. Their quality & your service both excellent! Just a note thank you for your personal help and prompt execution of the order for my daughter’s cat. Pip no longer hits his nose on the net but loves the fresh air and taste of outdoors that the panels offer. Thank you for the speedy delivery. Titus the cat has tried climbing up the mesh but it has defeated him so far and all is intact. Such a simple and unobtrusive solution, and we are both enjoying the fresh air! 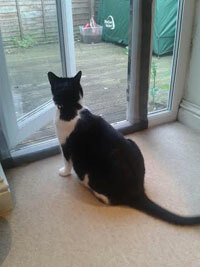 Hi Dominic, The flat cats arrived yesterday, took about 5 min to sort out and fix to two of the living room windows. Very easy install. Thank You so much, I’m cooler, the cats are cooler, we are all happy. If you ever get back to Birmingham, give me a call, pop in and have a coffee and meet the tribe. 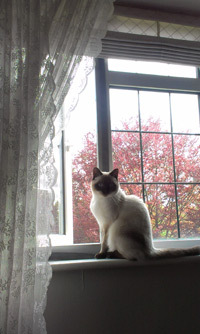 Hello - I would just like to say thank you very much for the product - it is just wonderful to have the windows open again without my cat jumping out. Whoever designed this product - thank you. Thankyou for the flat cats they are very good and fantastically easy to fit. We live in a flat with two fully grown ragamuffin cats. We were afraid to open the windows too far before, so in summer we all got a bit too hot. This is a perfect solution. Even though one of our cats keeps getting his claw stuck in the mesh, you think he would learn. I just wanted to say thank you so much for your kind assistance in the ordering of my flat cat screens. They have arrived (very promptly! Thank you!) and i have successfully installed one in the bed room so far. I thought i would see the reception it received from my girl Tuppence first before doing the rest. 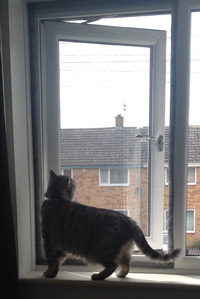 Well, i really am so impressed with the product as she sniffed around a bit at first but has so far not clawed or shown a great deal of interest other than sitting by a now fully open window which makes all our lives a lot more comfortable! I am so so happy that we can do this now without worrying about her it is fantastic and i will be following on putting the others up shortly. I am not sure how long it will be until i have to replace the velcro sticky as i seem to have quite a narrow window frame but i am more than happy if that is the only small issue i have. Thank you so much again and believe me i will be passing on your good name! Just letting you know, everything arrived safe. Thanks very much for the quick turnaround. I, my cats and my overheating computer are very grateful! I just wanted to say how brilliant the flat cats are! They fit perfectly and our cats are able to go and sit by the window smelling the fresh air without us freaking out that they are going to fall out! They don’t seem to bothered by the mesh either and seem to know that they cant push up against it, they haven’t tried to pull at it or anything. Thanks so much, these are an absolute godsend in this hot weather and given that we are 18 floors up they are an absolute must!! 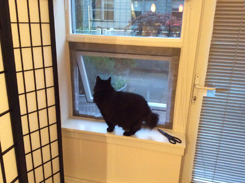 Our custom Flat Cat screens arrived on Friday afternoon. – they’re very well made, a great fit, and work a treat! All received, fitted and working like a charm. I will be ordering more! Many thanks for the prompt delivery of our two custom made Flat Cats. I have just fitted them to our windows; they are a perfect fit and so easy to put up. 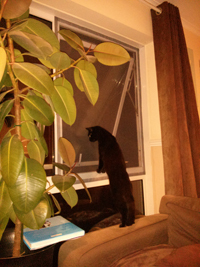 We have always adopted older special needs indoor cats who have never shown any interest in our large open windows. However our new addition Tilly - a 9 month old indoor cat has bundles of energy and curiosity so we are so grateful to have found your website offering the perfect solution. 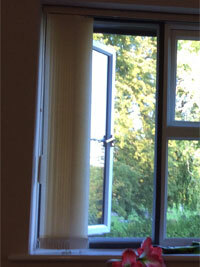 We can now fling our windows open wide again and hope for some sunshine this summer. Many many thanks for all your help. I have just received my Flat cats today Saturday 07th July and they fit perfectly. I will be contacting you again sometime next month to order at least another two. Once again many thanks for your quick service. 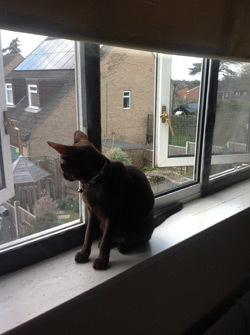 The flat cats arrived this morning and they are now up at the windows, very easy to install. Can feel a lovely breeze coming through my lounge. The cat is still to investigate them, i,ll let you know how she gets on and i,ll write you a review for your website too. Thank you so much for a very speedy delivery. Hi Dominic, just to let you know I have received my order and it is perfect thank you ever so much for your help! The new Flat Cat fit the windows really well and our cat Sammy has not even seem to have noticed them, but we are enjoying lovely air flow through our bedroom windows with out the worry of the cat getting out on the window sill, Thanks again for such a great product and I hope your business does well. Just wanted to let you know that the order arrived safely and is now installed. 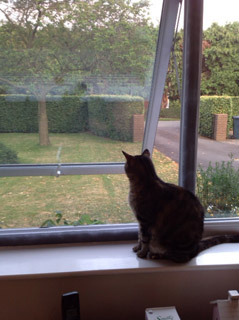 Beckford, my cat, is having a lovely time looking out of the open window and enjoying the breeze! 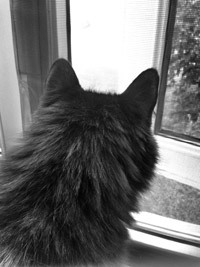 Beckford had spent two years at a local cat rescue home (she had been dumped when she was six months old) and so I have been advised to keep her indoors but she loves looking out of the windows at the birds and other cats wandering past. Many thanks for producing a simple but effective system. Can I just say that I am really impressed and delighted by how friendly and jolly your messages are! I'm looking forward to receiving the product. From your emails, it seems like you take all your customers' orders seriously. I thought, as we were just buying our second set of flat- cats that I would let you know how good we find them. 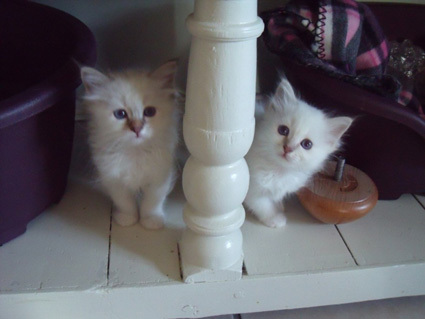 We have two Ragdoll cats, Barney and Callie and got the first set when they were kittens. All advice we had when getting the kittens was that Ragdolls should not go out, that they were too friendly and not savvy enough to cope with the outside world. We tried therefore initially to keep them in, but this proved impossible, and on one occasion a neighbour rang the bell to ask if we were aware they were on the roof of the porch ( this prompted our initial purchase!). We now try to let them out when we are home during the day, but when we are not they are kept in, so the flat-cats are useful in that we can have ventilation ( especially at night as they watch the moon from our bedroom windowsill) but they cannot escape! we can be sure that even though the window is open they cannot get out- and to be honest they soon learned that there was no way through they don't even think there is a route through now. The flat-cats have been a bit clawed in the beginning, and as we are in the process of redecorating we decided to replace them with a new set, but feel the price is so reasonable a second set was not a major extravagance! The most complicated bit was finding your website again! Many thanks for prompt delivery of Flat cats............have just put them up and am hoping for a cooler nights sleep, without my cat attempting to leap onto the roof! 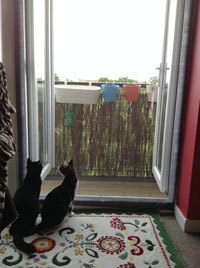 we received and installed the cat screens a few weeks ago and we are very pleased with it. Your suggestion for the large custom screen works really well. Many thanks for the excellent service. Thank you. Flat cats received and installed with no problems :). 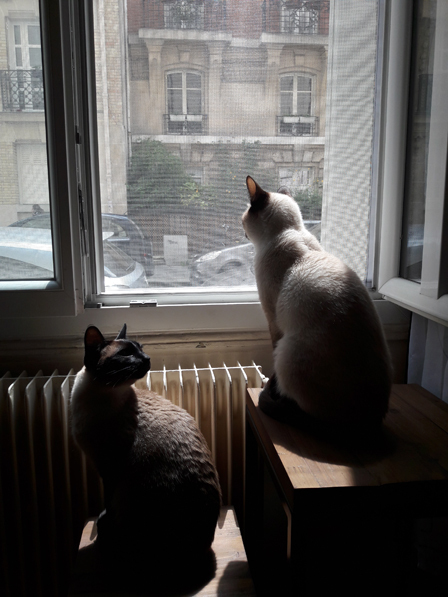 Thank you for the Flat Cats, it is so great to open the windows and feel the breeze without having to close them within minutes, just in case. 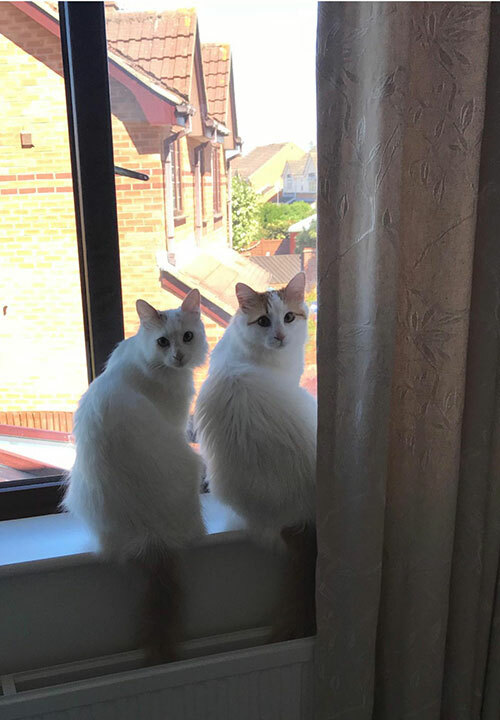 Our cats were a little confused and sat on the window sills looking at me for an explanation, I did of course give them a full and thorough explanation as to why it looked like they could get out, but actually couldn't, I am sure they understood!! It's a relief to find a product that is useful and easy to order! Just a quick email to say thank you very much for our flat cats. 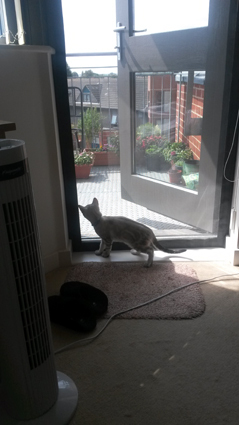 I brought them for my indoor kitten (please see the picture attached of my kitten enjoying the fresh air from her new flat cats) who has asthma so its not recommended that she goes outside. We received them last week, which was very fast considering we needed custom made ones and they are very quick and easy to fit. 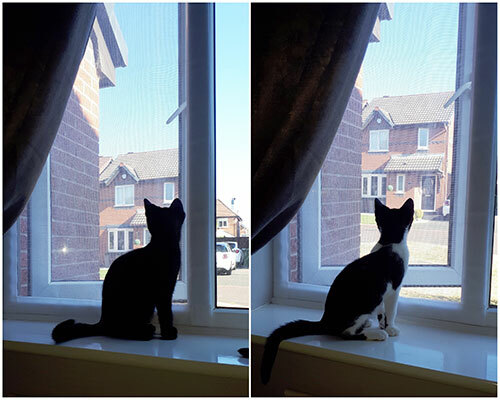 It is nice to know that my kitten is getting fresh air in the safety of her own home and lucky for us as we have just got them fitted in time for the oncoming warmer weather. I asked Brian to email you and let you know that flat cats arrived safely on Tuesday, and are all up and working well. Thank you so much we are so pleased with them, especially me, cause I can now have my fresh air. Mr Smudge not so pleased, because he can smell fresh air, but can’t get out. He has tried, but has not been successful at it. J (chuckle) (heeee heeee). One of the residents asked us where we got them as she was really interested because they would keep all the nunus out (insects) and mosquitoes. Once again a very big thank and very much appreciated for all your help. I would just like to say thank you for my flat cats, my cat fell out of our 1st floor flat, luckily he was ok apart from a broken tooth, I immediately went on line, found you company and ordered some screens. The arrived within 2 days, and I now have a cool flat and safe cats. Thank you so much for the peace of mind I now have, and thank you from my cats. Dominic, you are a genius, I only wish I'd found you years ago. At last I have cool clean air circulating my bungalow, and my 2 best friends Tiggy and Peep (she's shy) are asleep on the windowsills loving the breeze, and I'm happy in the knowledge that they are safe and secure. Thanks a million, if you have any queries from people in my area, send them round !! Thanks also for the lightning speed of manufacture and delivery, I was very impressed. Hi Dominic, Just wanted to say I got the window guards through they are brilliant thank you so much! Given me much peace of mind. Just to say that I have received my flat cats and I am very pleased with them. I have fresh air without fear of killing my cats! Wish I had found you earlier. 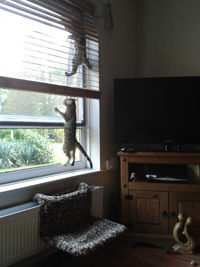 Just wanted to say 'thank you' for getting the blinds to us so quickly. They arrived on Friday and fitted perfectly - your advice about using two smaller blinds rather than a single large one was very helpful and a repeat order will undoubtedly follow in the next couple of weeks ! Thankyou for your help regarding my flat cat purchase. After speaking on the phone you advised a standard flat cat for me rather than a custom one, saving my pennies! Just found your website. Looks great. Our baby cat (15 months old and born with no eyes therefore no sight) fell out the window for the second time yesterday. He broke his back right leg in 4-5 places. He had internal bleeding. We thought he’d learnt his lesson after the 1st time . . . and we were wrong . . . or he just slipped . . . anyway, now I’m really kicking myself that I didn’t search the net before to find your site. I had in mind something like you’re describing exactly and was thinking along the lines of the kind of door guards that you get in places like the US to leave doors open and let air in, but at the same time keep bugs out . . . and then your website pretty much matched my plan in my head. Genius. I shall carry out measurements tomorrow with my wife and we’ll get back to you pronto – not letting him try out any more of his 9 lives . . . Bless him. The cost of leaving this too late is looking to be around the £1k mark (we’re not insured) . . . You might want to use our story as a testimony on your website in the future, along with some pix from us too. I have already purchased one flatcat and it was a life saver. i now have an un-stuffy apartment and a safe kitty! i am now putting them on windows through out my home. thank you! Just wanted to drop a line a say thank you for the flat cats. They fit perfectly, look good and are doing fantastic job so we are all enjoying the sunshine in the knowledge that Austin isn't going to endanger himself with an open window and the added bonus that no horrid bugs can get IN - is absolutely wonderful. I've told a friend at work who has been on your website too so will continue to spread the word about Flat Cats. 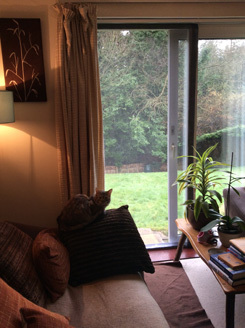 My Flat Cat custom made order arrived today and I am really pleased with it – such a simple but great idea, now I can have my patio door open without worrying about the cats escaping - that is of course if it ever stops raining! Flat-cat all up in the sunshine, thank you again. A friend saw it and very well may be ordering some also! Just wanted to say that I have received my flat cats (really quickly), just in the nick of time before we melted, how hot it has been! 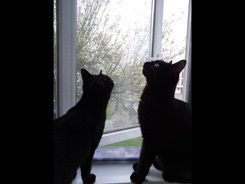 I had them up in a jiffy, and Molly and Poppy (my house cats) were immediately at the window sniffing the fresh air, chattering to the birds and generally enjoying themselves. They have been imovable from the windowsills all evening. I am writing to say a big 'Thank You' for your help and advice. The three screens are (pardon the pun) Purrfect! They only took minutes to install and fit so well. I now have the confidence to allow the cats free roaming in the house. My daughter is especially pleased as they also keep out insects, she would have had to keep her windows closed at night in the past. I would also like to thank you for the speed of dispatch considering I ordered made to measure sizes. I am happy to recommend your product to any pet owner or anyone requiring top quality insect screens. It was a pleasure to purchase goods of top quality materials and service. Thank you so much for making and sending my Flat Cats so quickly. They're now in place and are absolutely BRILLIANT. Ralphie looks a little peeved at not being able to try and take death-leaps anymore, but she's getting used to them and I'm absolutely delighted to have some fresh air in the flat without needing to worry that she might go splat. I'm so glad I found you! 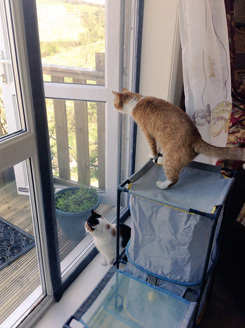 hi, i have received my flat cats and i must say im very impressed they are very good and so far no escapees.The cats seem to understand that they cant get out if the screens are down.Thankyou fro all your help i have recommended you on the your cat forum. Hi there. Just wanted to let you know that the screens are up and working like a charm! Even at 5.5 kilos he can lean against them safely...thank so much! 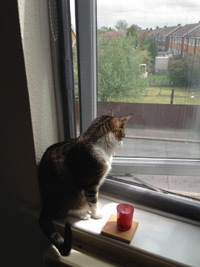 Dominic, I just wanted to say thank you - I am in my flat with the windows wide open and the cats love it! I will be ordering more for a friend soon. Hi - I'd just like to say thank you for a fantastic service and product, I will definitely be recommending you to all my cat friends! 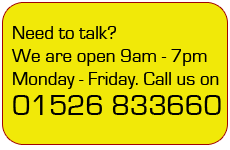 I will leave feedback on your website also, and let people know about your fab customer service. Just to let you know that I received all the flat-cats today and they are perfect! I was so impressed by the workmanship and the ease of use, as well as the prompt delivery. Thank you so much. I just wanted to contact you to say how brilliant Flat Cats is! I recieved my custom order much faster than anticipated and attached it to the window this weekend. It is so nice to finally be able to open the window and let fresh air into my flat. 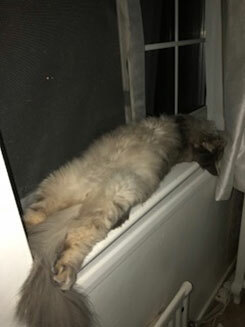 My little Ragdoll has literally spent his weekend sat on the windowsill taking in the fresh air and listening to all the new sounds going on outside - by Saturday night he was exhausted! I am definately going to place another order for my other windows. Its a simple but brilliant solution to a very common problem for cat owners everywhere and I have already been recommending you to friends. Just dropping you a line to say the screens are perfect for the windows and they have the added bonus of keeping the flies out! I've recommended them to a few people and sent your web site address to the cat rescue where I got my cat so maybe others can give them a try. ...they are perfect!!!! Im so pleased with them. They are very easy to fit and they seem to be quite strong too. So a very very happy customer!! I will probably purchase more for other rooms. I will let the members on Pet Forums know how fantastic they are and the service I received. Just wanted to say that we are very pleased with our Flat Cats. 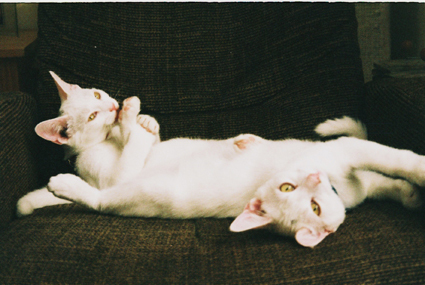 They were easy to fit and have put our minds at rest with our 2 new energetic, adopted cats. Many thanks! I received my custom Flat Cats today and wanted to just let you know I think they are brilliant and have been really impressed with the service from the company. Just wanted to let you know that my order arrived today. We could not live without these now - it is so good to finally get some air through the flat! 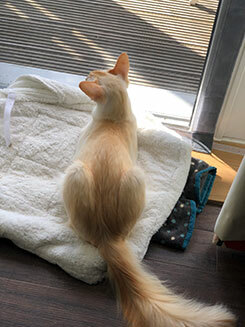 Also - if you get a minute - check out my blog - I have included a link to Flat Cats - what a great invention! Hope you are well. Just wanted to send you a quick email to express my satisfaction in the flat cats that we ordered from yourselves! We installed them in the flat on Saturday morning; each one literally took 2 minutes to do. My partner and I were very impressed with the build quality of the product, and the measurements were also spot on. The kitten doesn’t seem bothered about trying to climb the mesh and loves sitting behind it looking out of the window in the breeze. Just wanted to let you know how much I am enjoying the use of my specially sized flat cat near a year on. 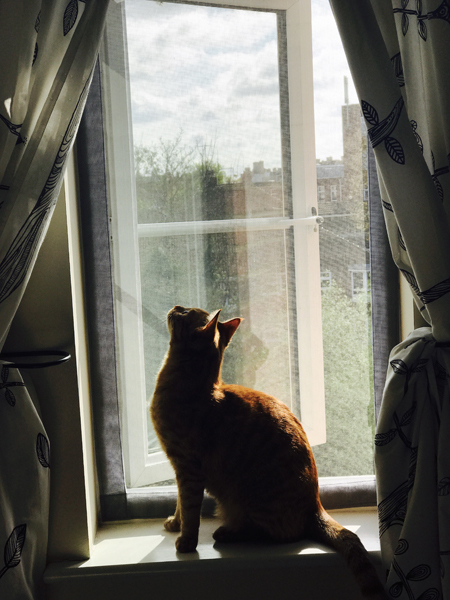 I love watching my cat Jamie as she sniffs the air and sits in the sun, and of course I love the fresh air flowing in my flat too! At long last i can relax in my flat while it airs. Such a simple solution to keeping my loved ones safe. Please feel free to pass on my mobile if someone needs to call me for a reference. I myself have been passing your website onto other people. I hope you do well out of this business. Just wanted to say received flat cats this week. Thank you very much for all you help and very prompt service. "Just to report that the flat cats have arrived and work wonderfully. Thank you"
"At last I can stay cool in the summer - you must get this product in the shops!" "Fantastic! 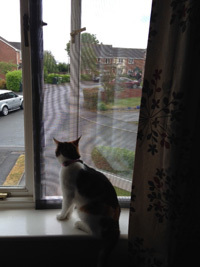 Rosie, my cat is now safe in our flat as I have window protection for her"
"Just to say a huge thank-you, what a great product"
"Just wanted to say thanks for the quick response to my order and speedy delivery. I am very pleased with the item. Thanks also for the refund after I had purchased 2 without realising you did a special price. Would certainly recommend your product to other cat owners". "Received order yesterday thanks , and the screens were perfect ! 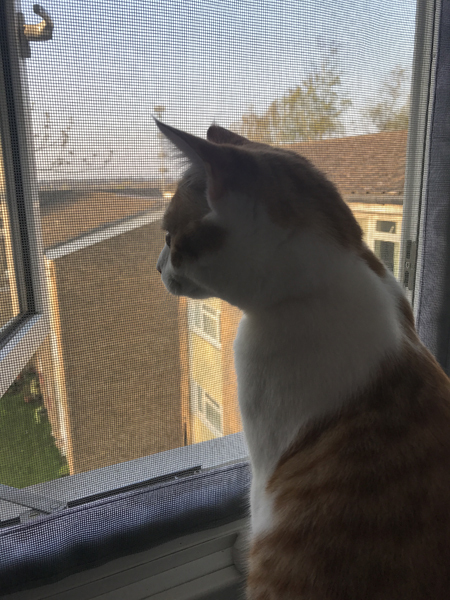 It is such a relief to be able to open windows upstairs without worrying about Smarty falling out, and he is loving sitting on the windowsill now with the fresh air and birdsong. Thanks again for your help, I have kept your contact details in my diary so I can recommend your product to anyone else who needs them". "Received my Flat-Cats today and all I can say is WOW!!!!! Thank you so much, they fit perfectly on all 3 and I can now open my windows especially with the nice weather. I have been extremely impressed with all contact and the speed in which ive received them, im spreading the word already for you. I wish you every success in the future and hope to see them in the shops very soon!! If you need any comments from me for your website or future publications I would be more than happy to oblige". 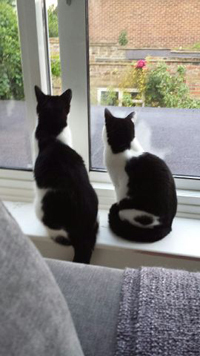 "Just a note to say we love the Flat Cat – Sid sniffed the air a bit, then has totally ignored it!!" 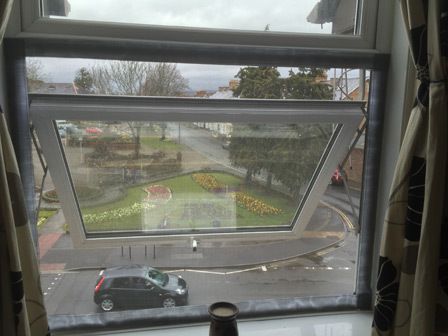 "I received my order from you three days ago and installed them straight away. 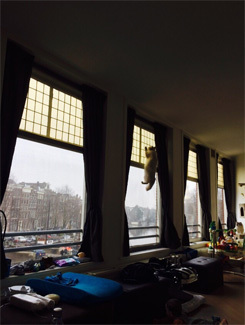 My cat, Simba, initially couldn't understand what had changed and tried to jump out the window, I have to tell you that I laughed quite a bit when she bounced off the netting. I must congratulate you on a great product. My girlfriend and I can finally have our windows open. You have opened Pandora's box for us. Because your product is so good we will be returning to you within the next two months for two more Flat Cats to cover our remaining windows. I have some other commitments to take care of first, but rest assured we WILL be back. Thank you for solving a huge problem for us. Keep up the good work ! " "Just to let you know I have installed the Flat Cat and it works a treat!" 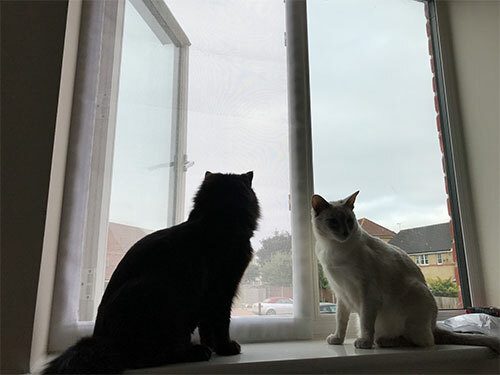 "Thank you so much for your great product, we can finally open up the windows and breath fresh air with the confidence of knowing our cats are safe. Would also like to add i thank you for your promptness and personal touch, it has been a pleasure and i will recommend this to all of my cat owning friends"
"We received our Flat Cat on Tuesday but only got a chance to put it up last night and just wanted to say, its fantastic! Fits perfectly and meant our house was cool last night while we were eating etc! Simba seemed a little confused by it all but he was very good so long may it last!" "These arrived today and are excellent – in fact I’ve just ordered a second pair for the back bedroom windows". "As per my phone call i have recieved my Flat Cat and i just thought i would send you a quick e-mail to say how pleased i am with them. They fit really well and look good . 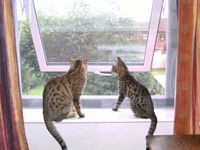 "I have received the flat cat screens today, can’t wait to put them up at the windows. I would like to say a big thank you for all of your help"
Flat Cats product is Patent Pending. This site is ©2014 Flat Cats (UK) No reproduction without permission. Flat Cats is a trading name of Dominic Parker Limited whose registered offices are 2 Maple Drive, Market Rasen, Lincolnshire LN8 3QB Company number 09208976 VAT reg number 195571275.